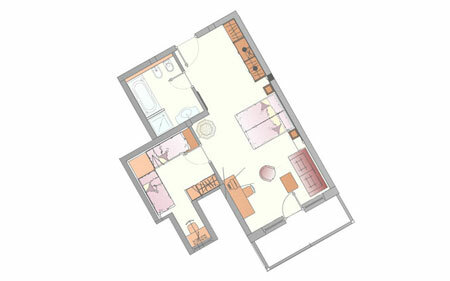 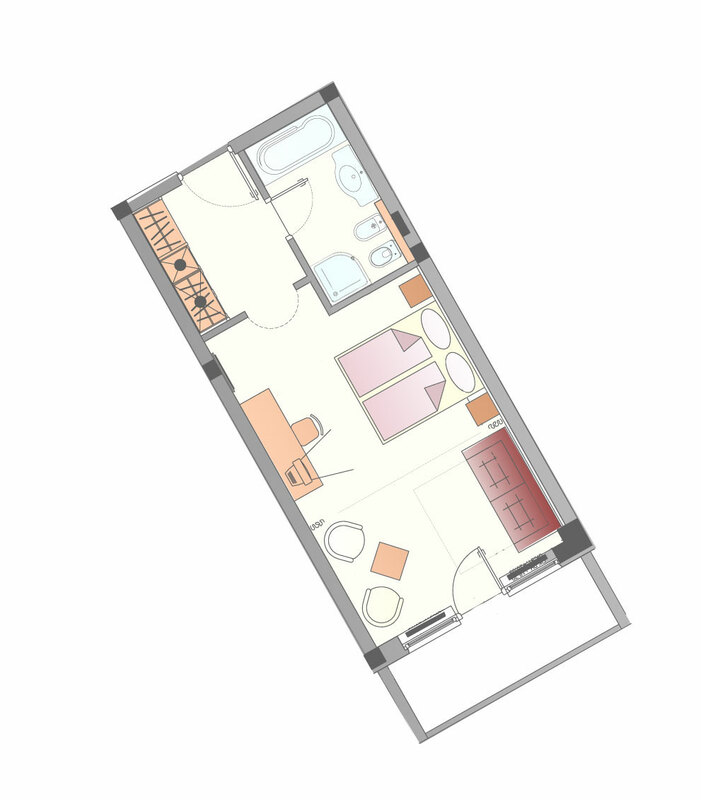 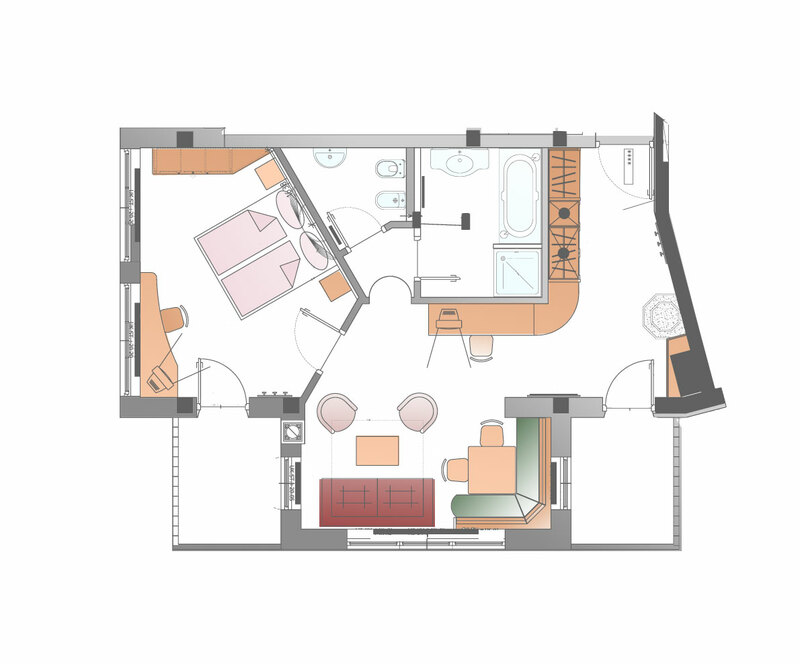 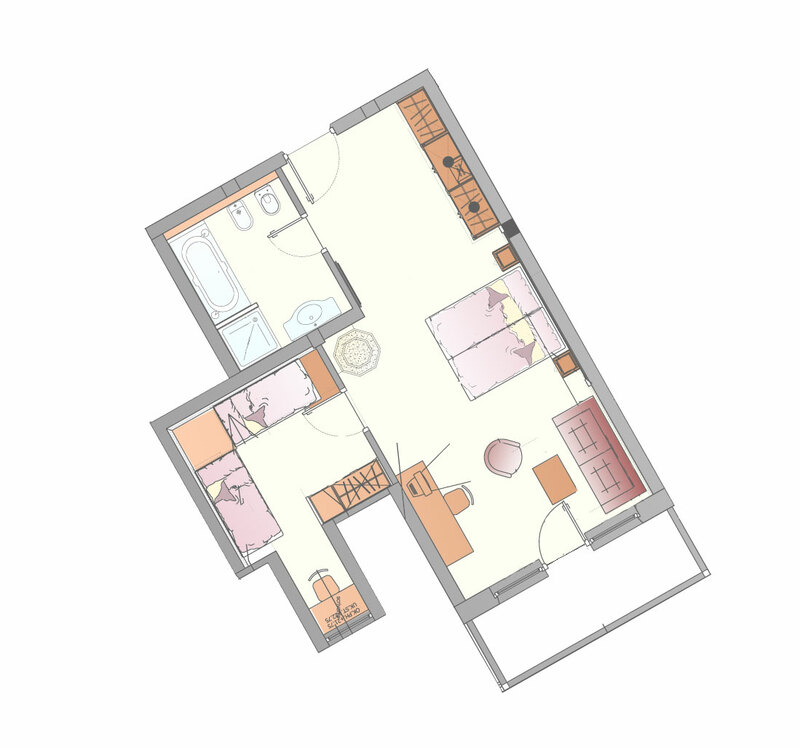 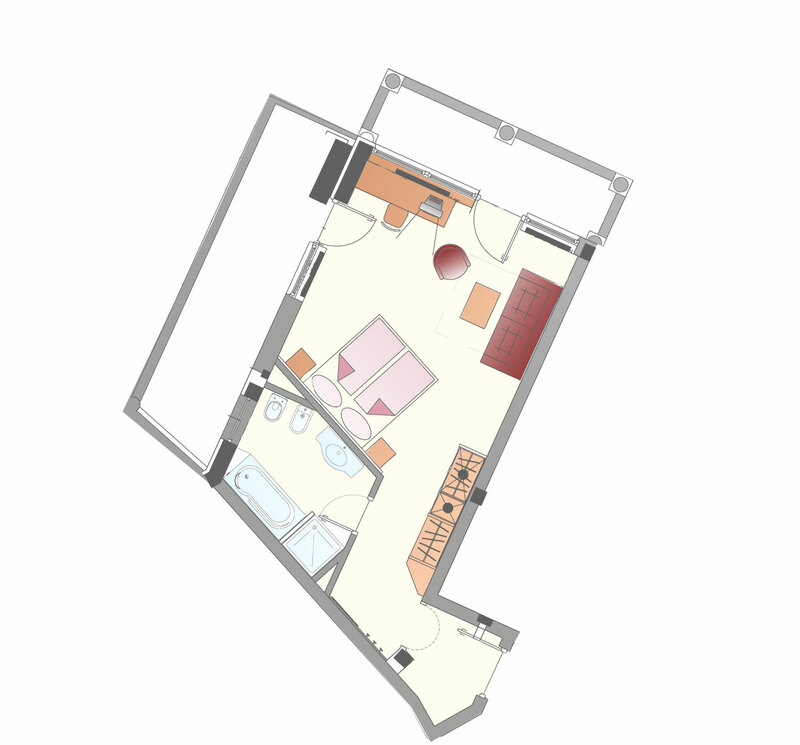 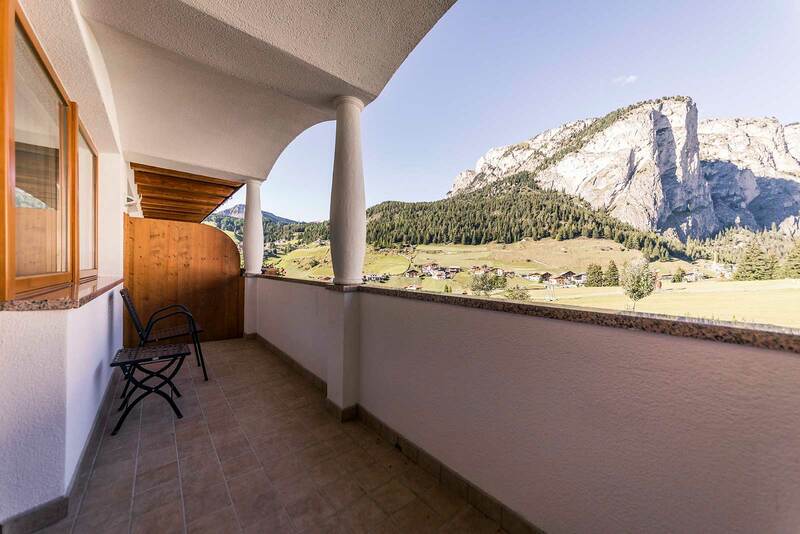 Superior (38 m²): with fitted carpet and with wooden floor (on request); Double or twin room, sofa bed, desk, balcony, TV, internet access, WLAN, safe, minibar, telephone, bathroom with bath and shower, WC and hairdryer. 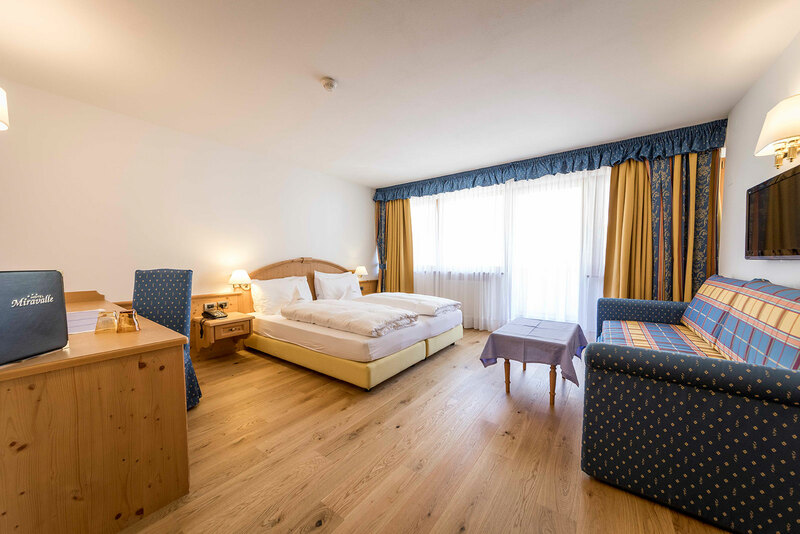 Junior Suite (40 m²): has a small anteroom, with fitted carpet and with wooden floor (on request), double or twin room, sofa bed, desk, balcony, TV, internet access, WLAN, safe, minibar, telephone, bathroom with bath and shower, WC and hairdryer. 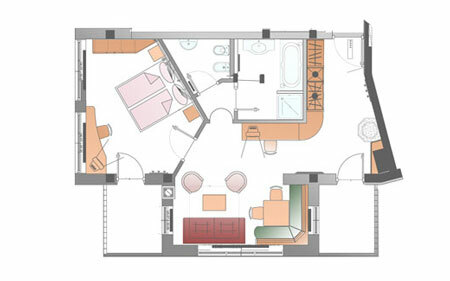 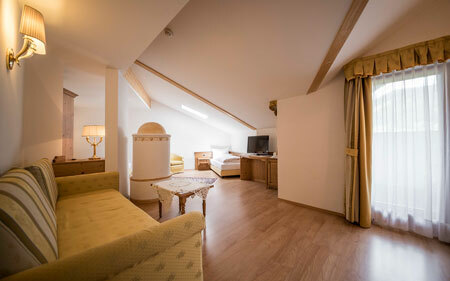 The Suite Blue (55 m²) has a wooden floor and consists of a living-room with a tiled stove, corner seat with table and chairs, a small couch, sofa bed, mini bar, balcony, double room, TV, telephone, Internet connection, safe, a separate bathroom with "Jacuzzi" bath, shower and hairdryer. 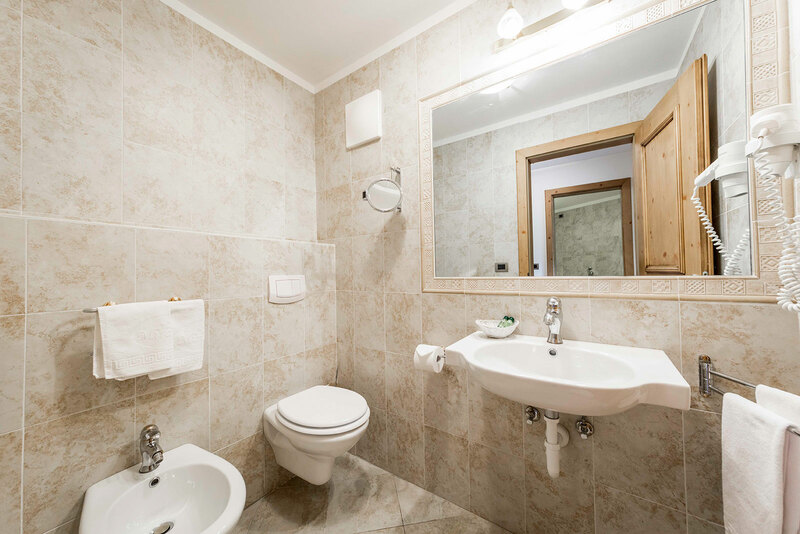 Suite "Miravalle" (64 m²): with fitted carpet, 1 double room, a small room with single beds, living-room with tiled stove, corner seat with table and chairs, couch, sofa bed, TV, minibar, tea machine „Tealounge“, telephone, desk, internet access, WLAN, safe, a bathroom with "Jacuzzi" bath, special shower, WC, hairdryer, balcony, second bath with shower, WC and hairdryer. 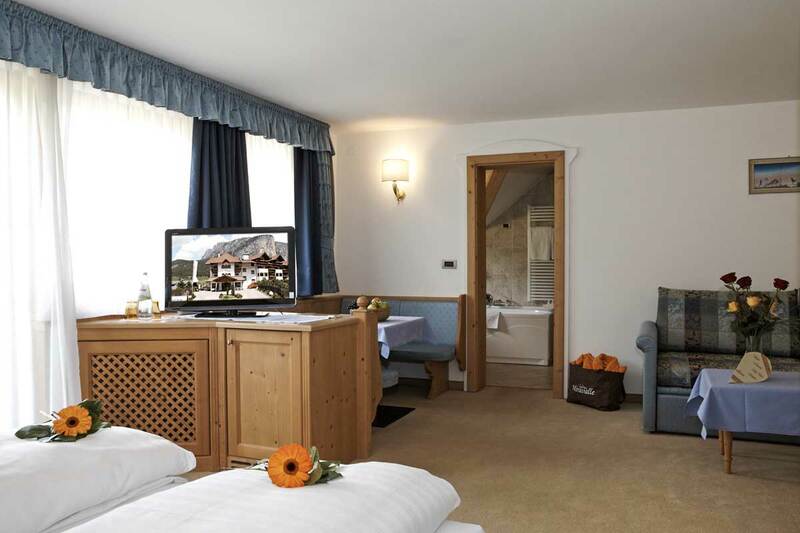 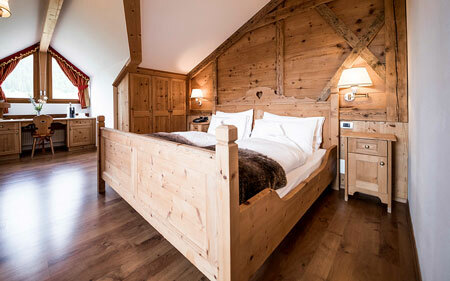 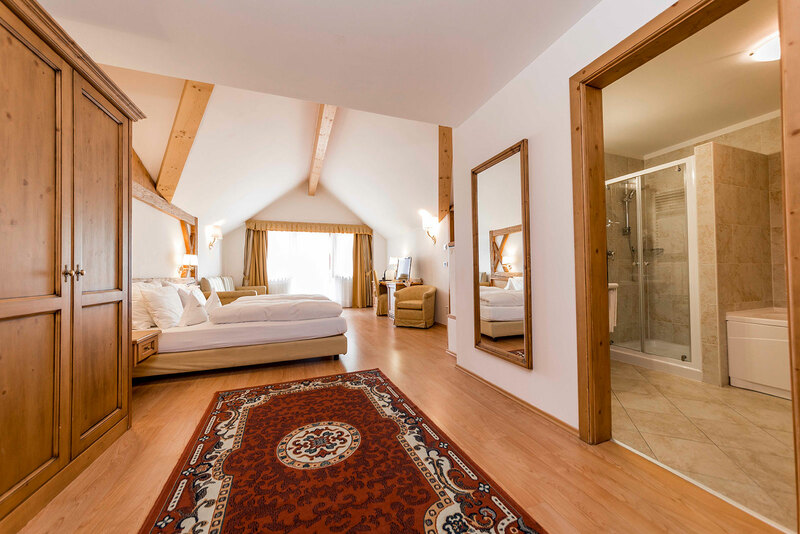 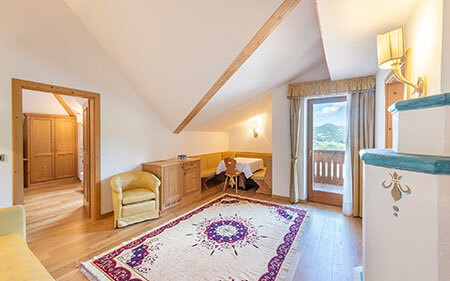 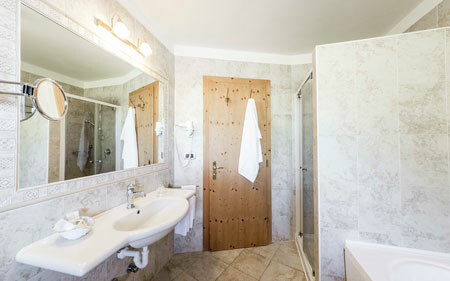 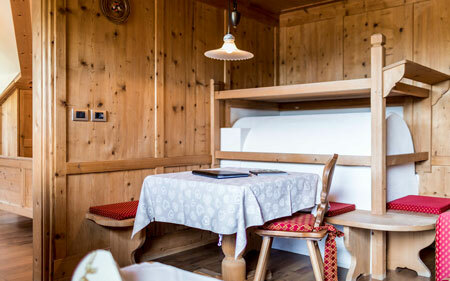 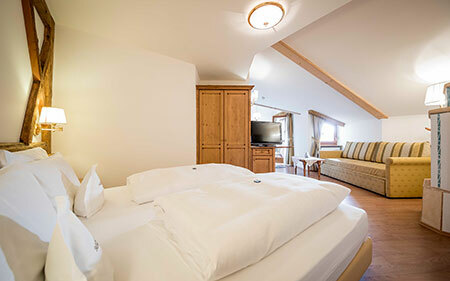 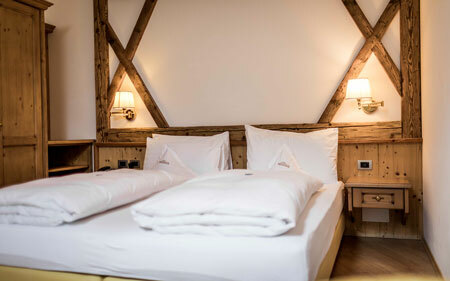 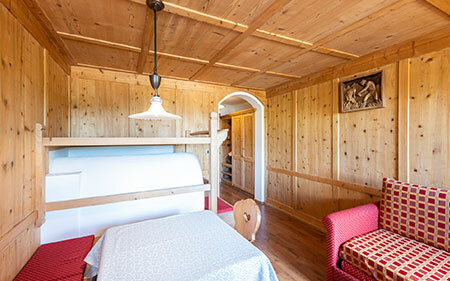 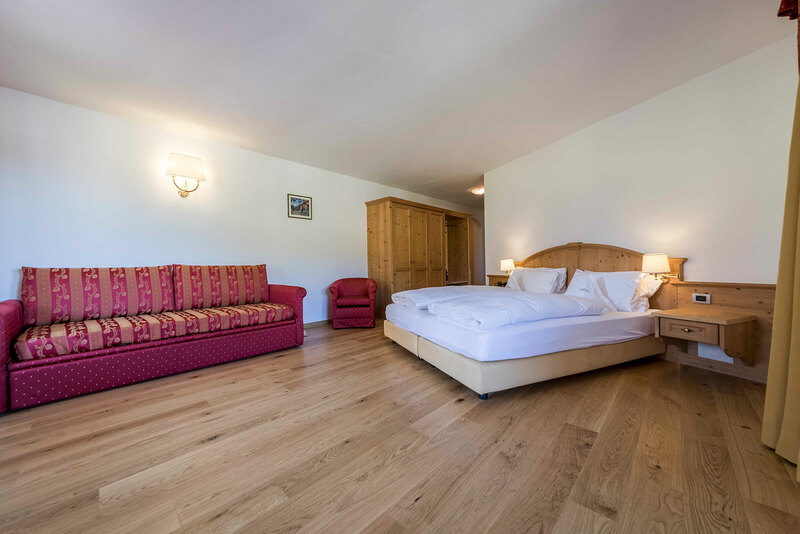 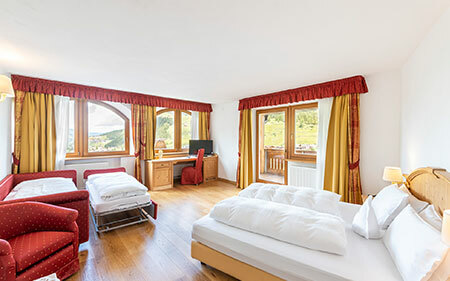 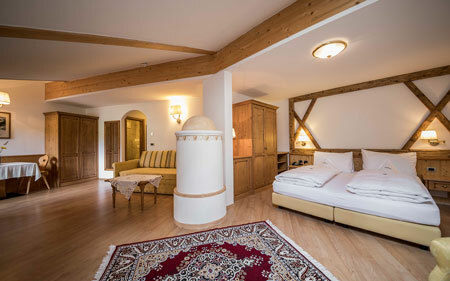 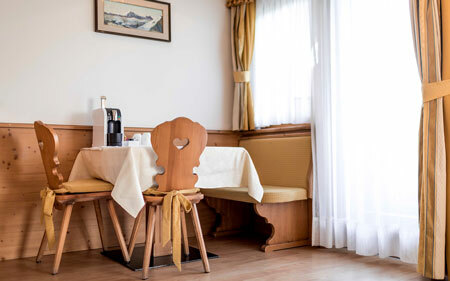 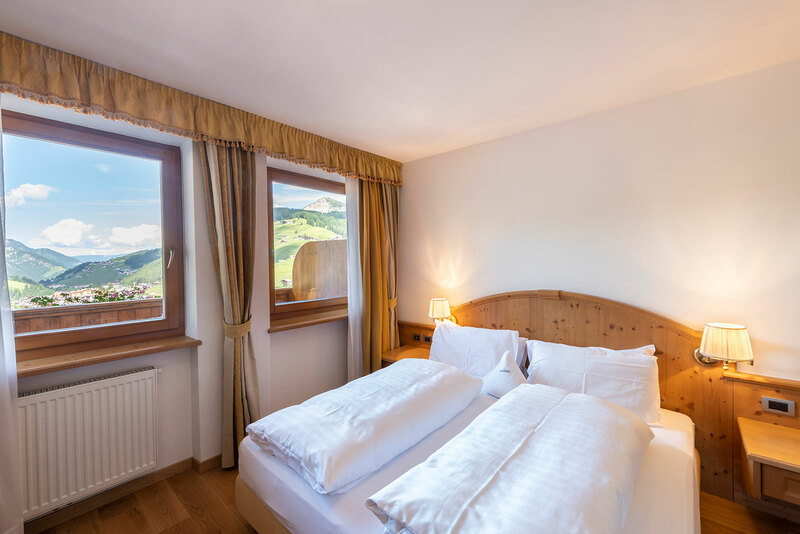 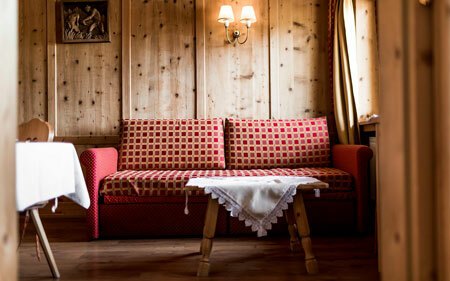 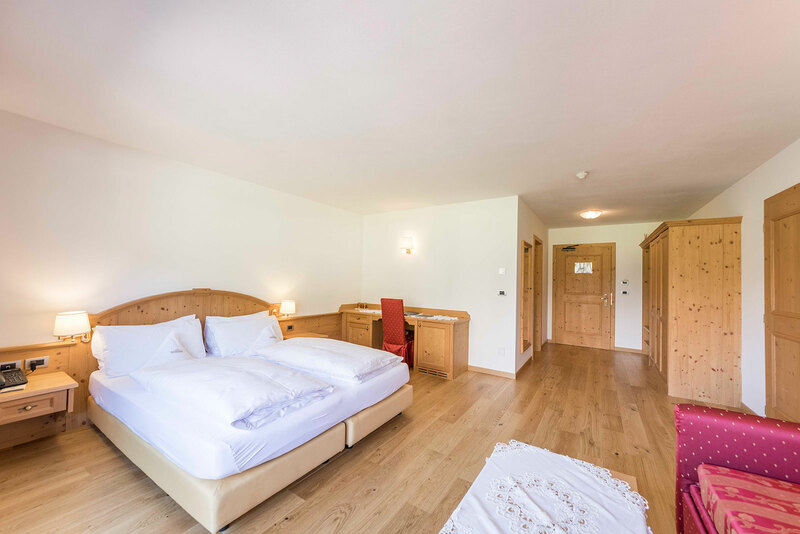 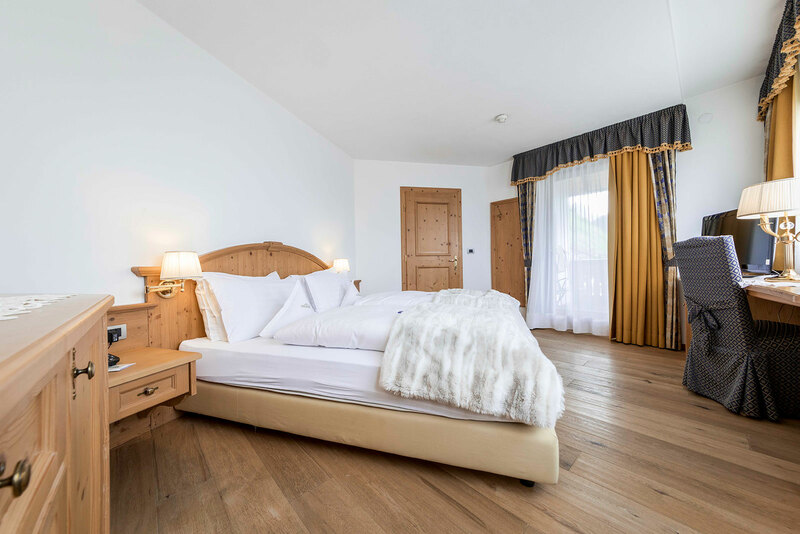 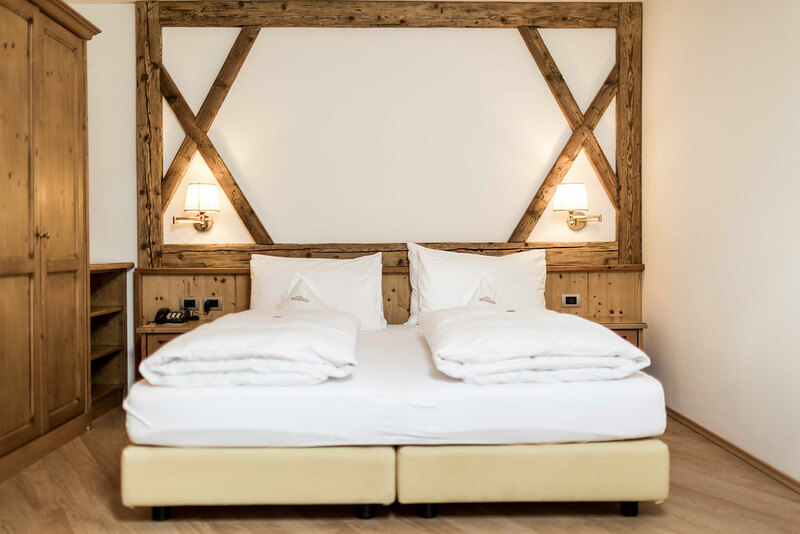 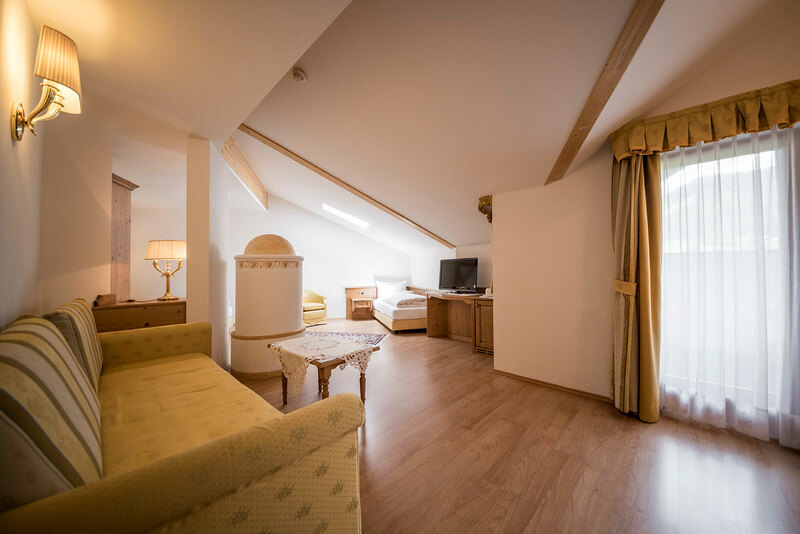 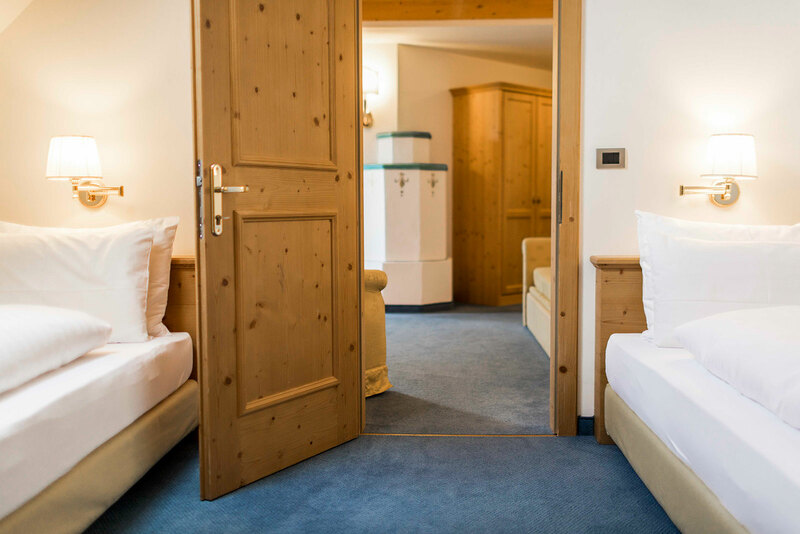 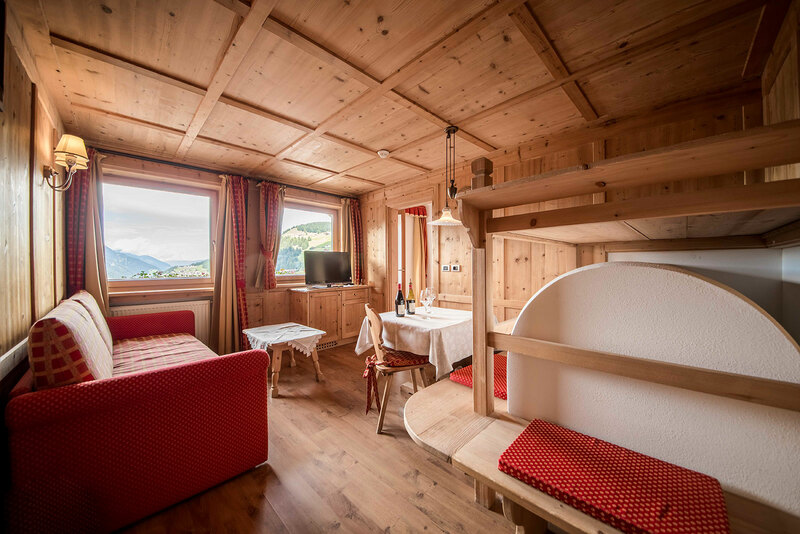 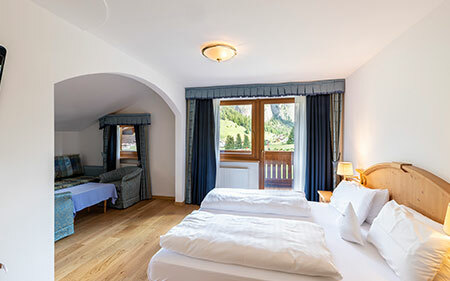 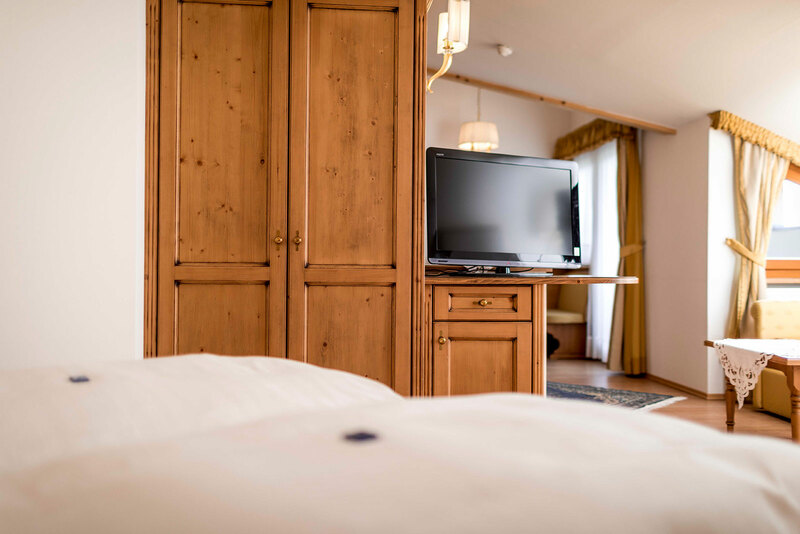 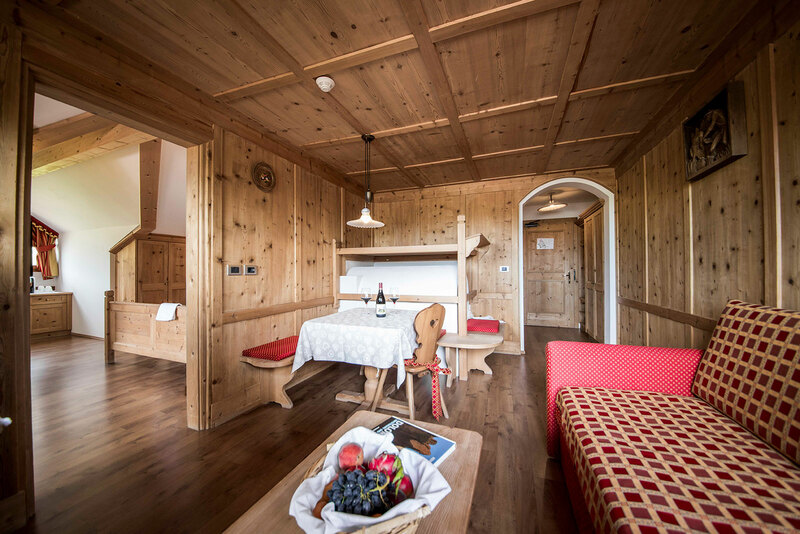 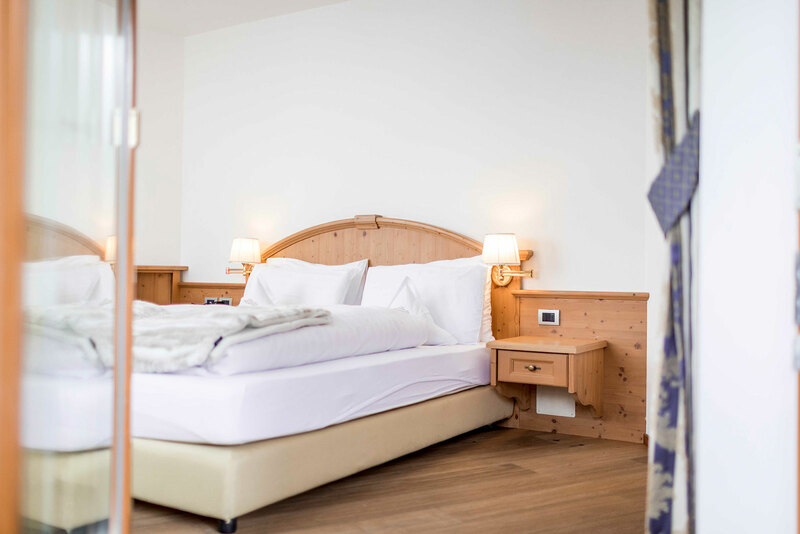 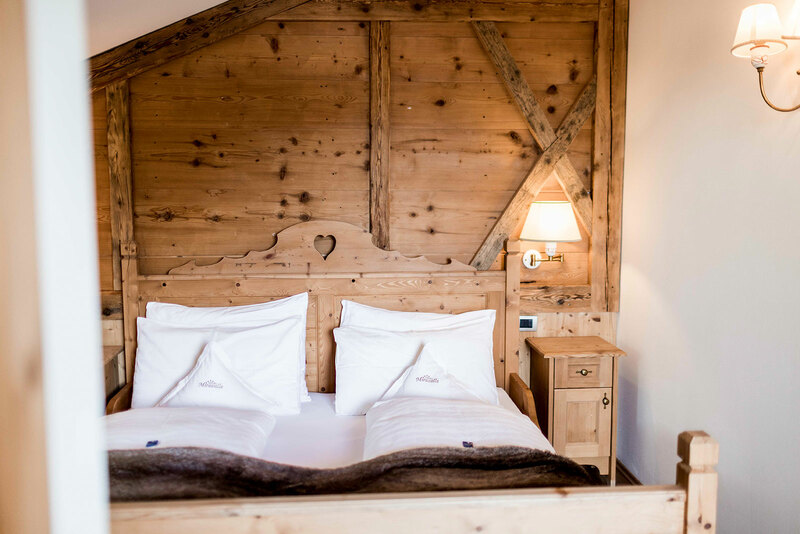 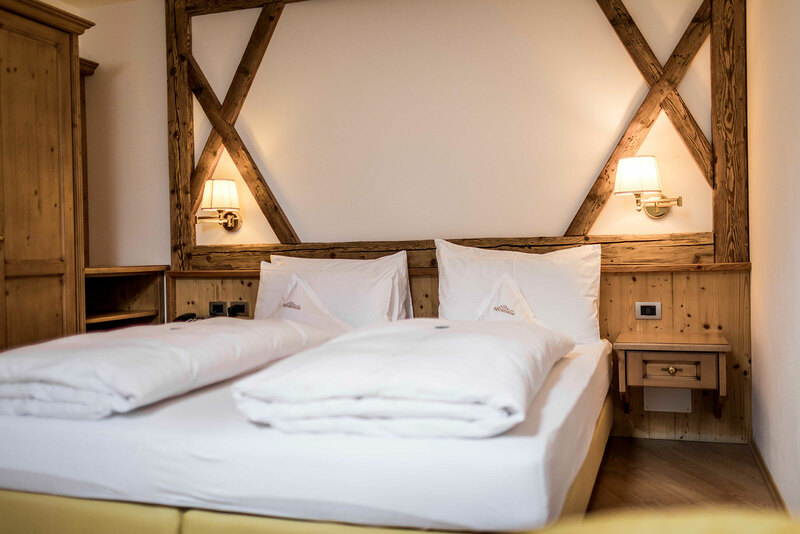 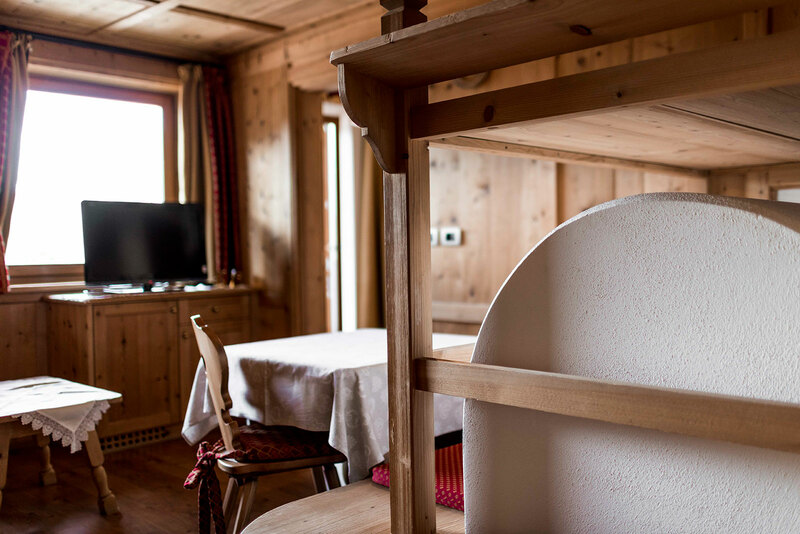 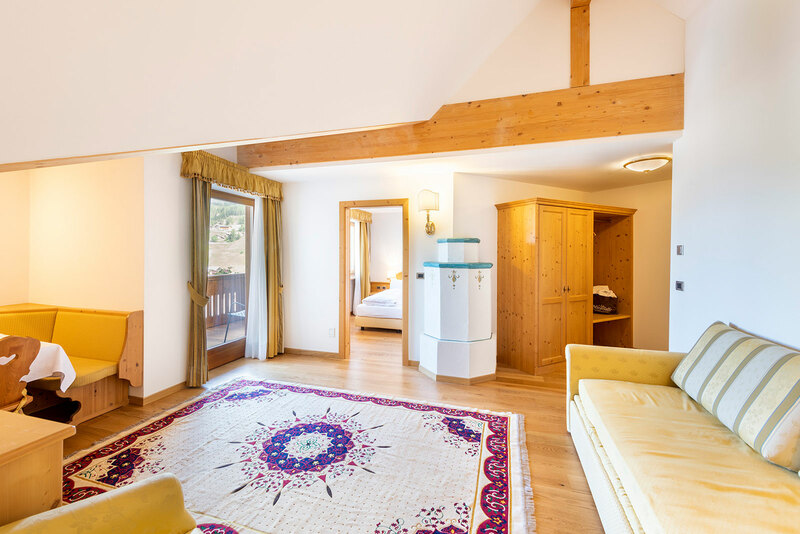 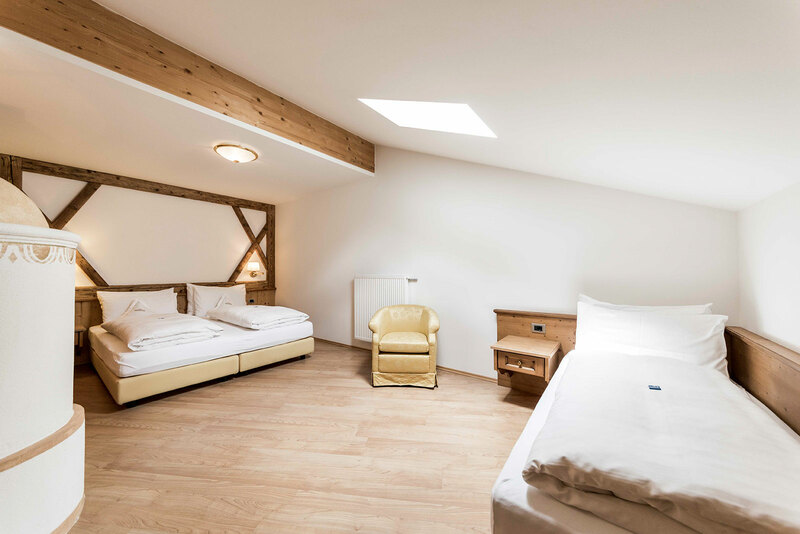 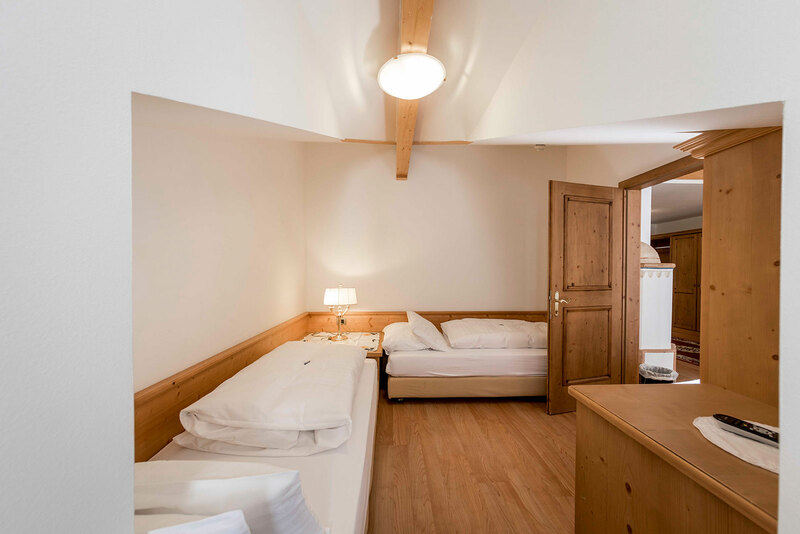 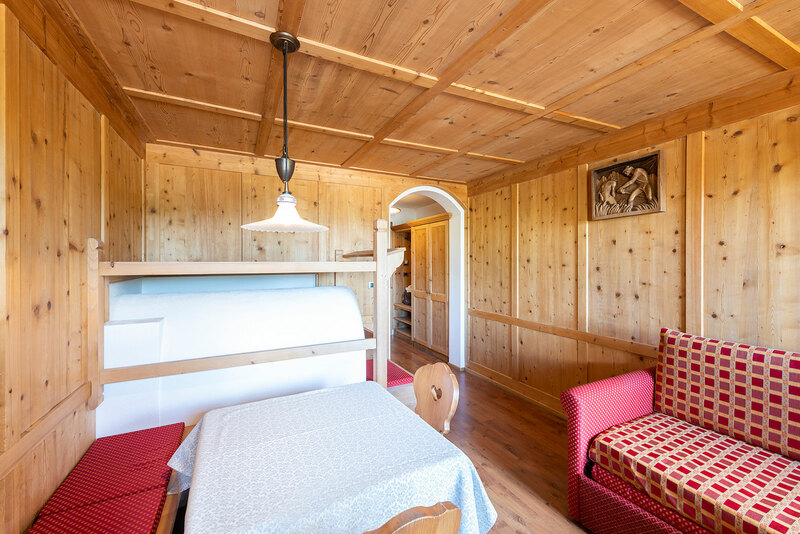 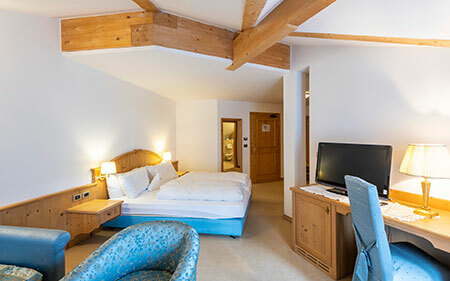 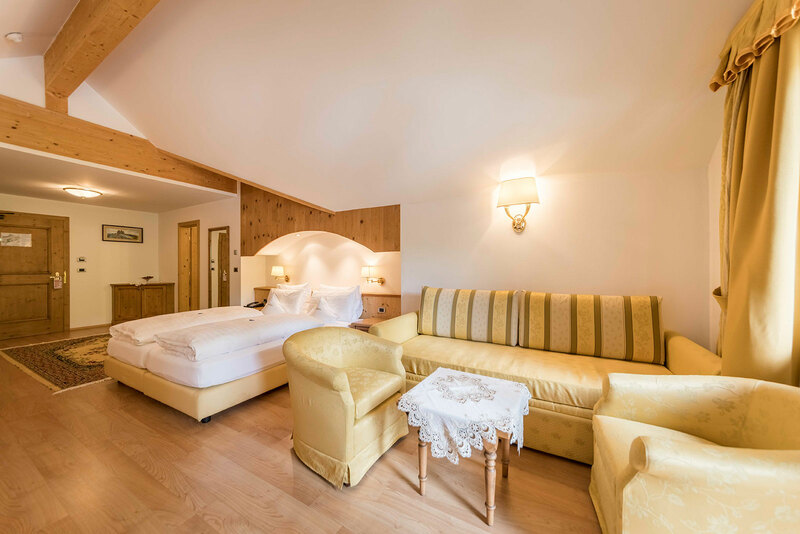 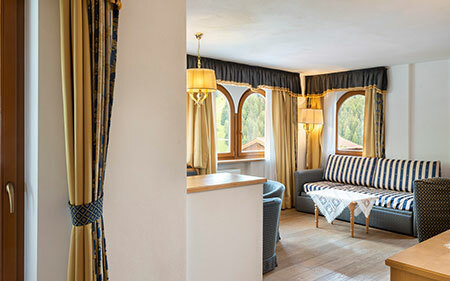 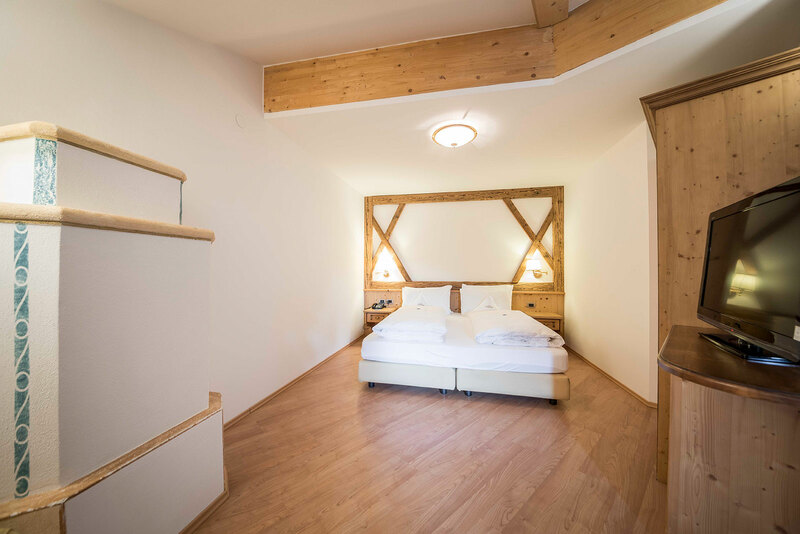 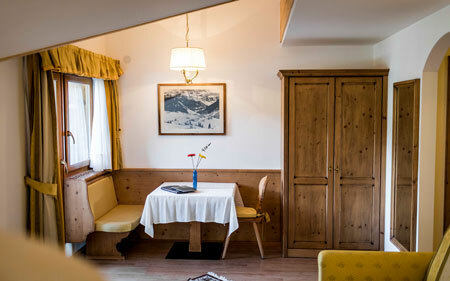 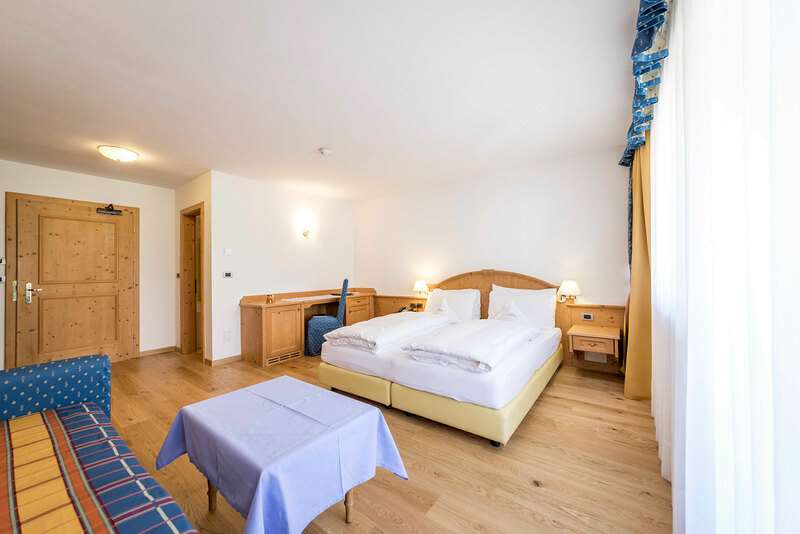 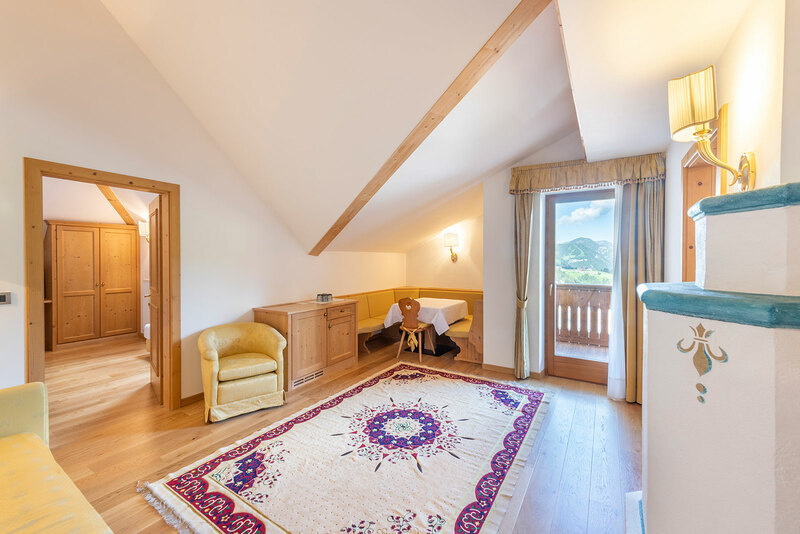 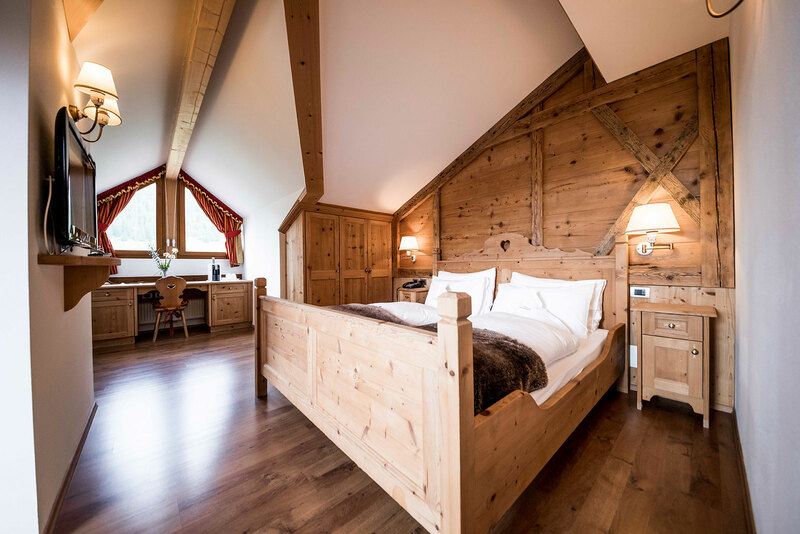 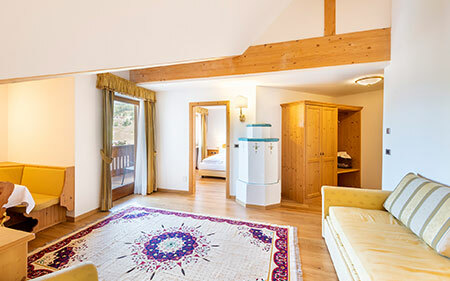 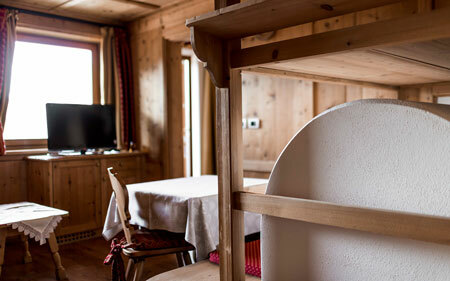 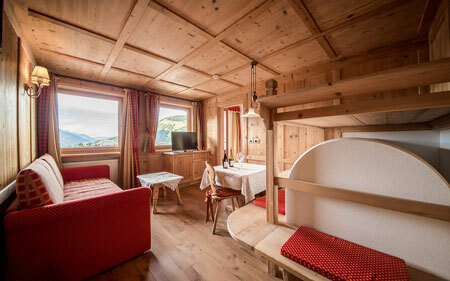 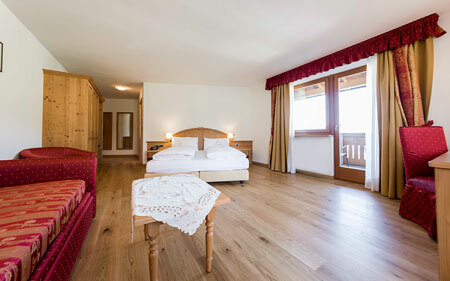 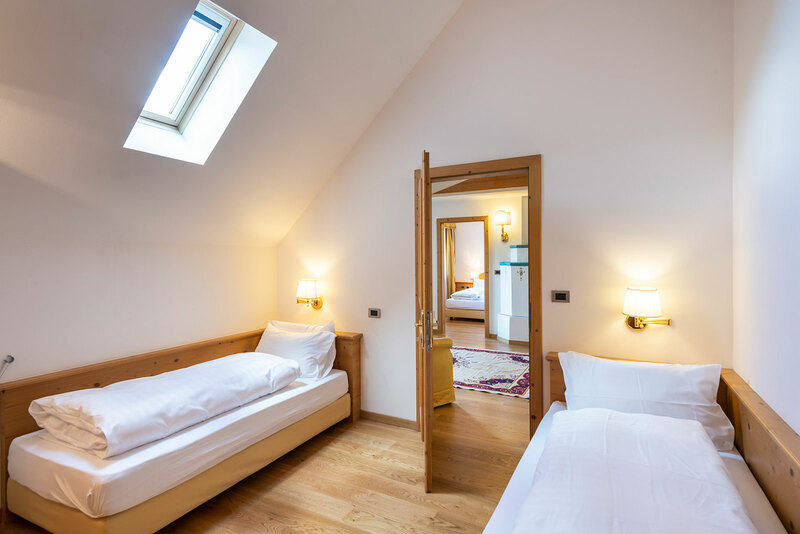 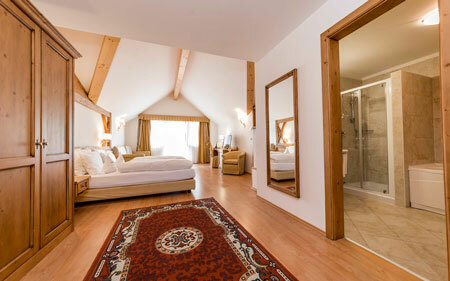 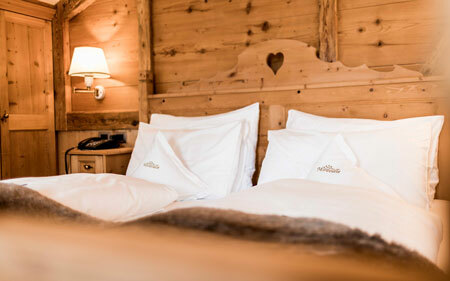 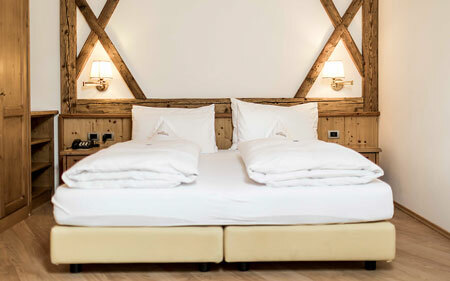 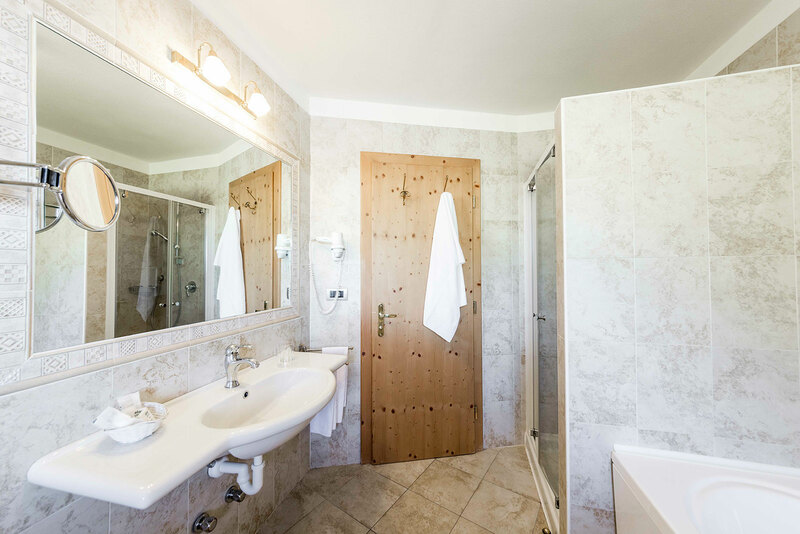 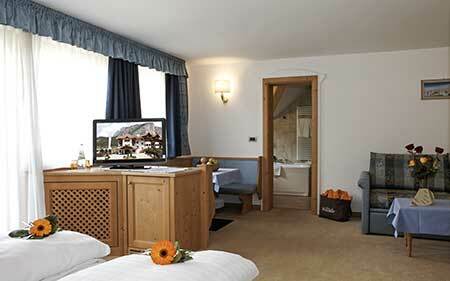 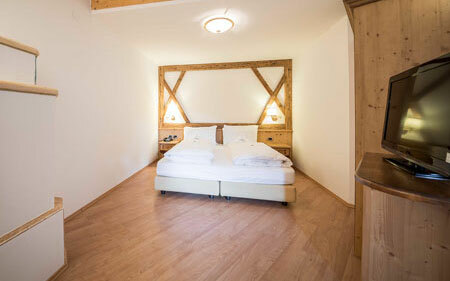 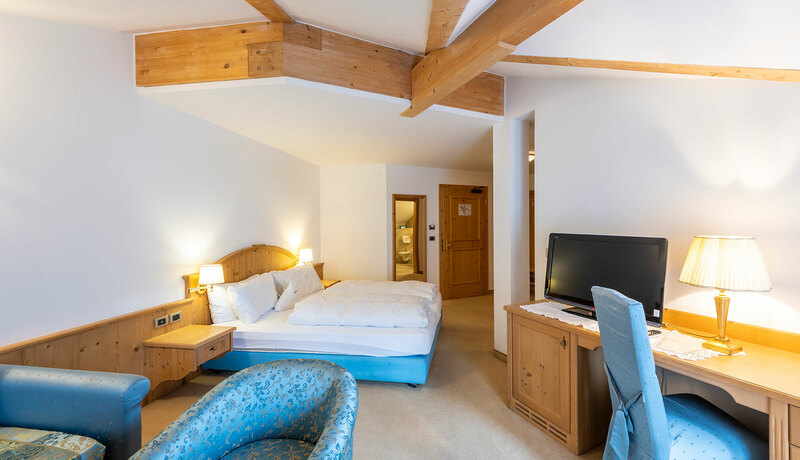 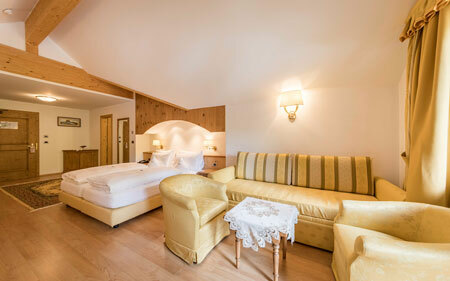 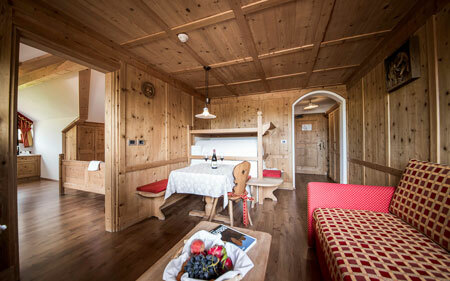 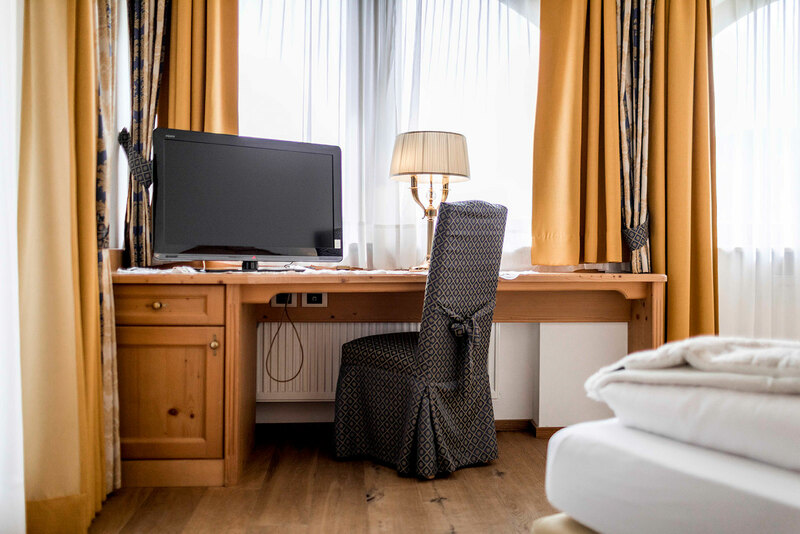 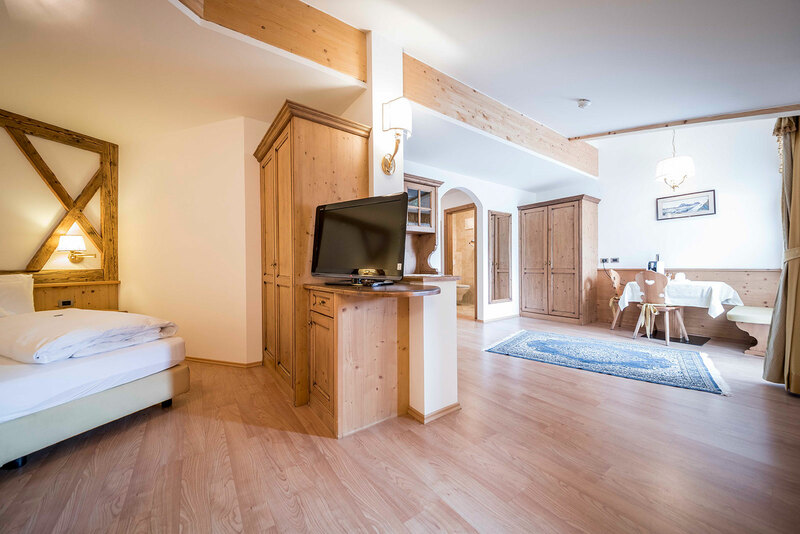 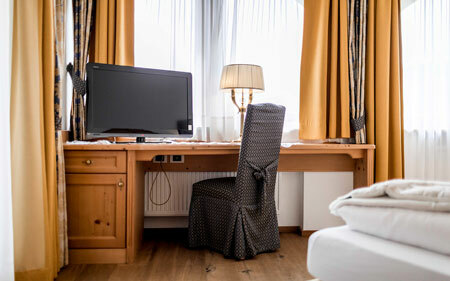 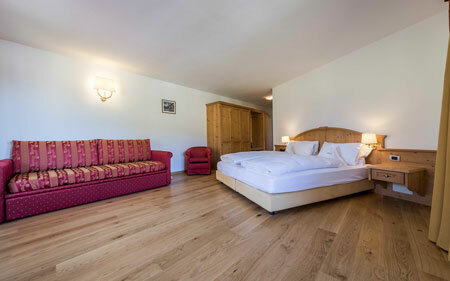 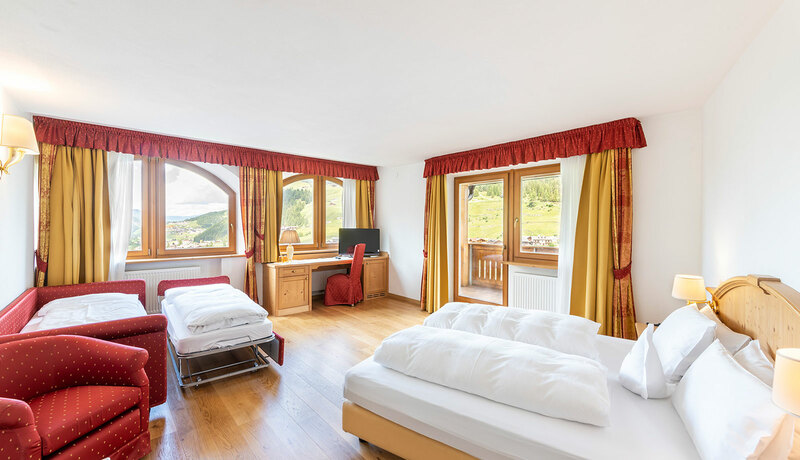 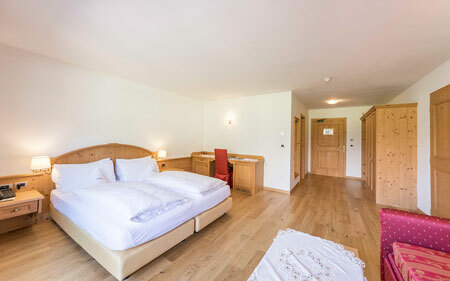 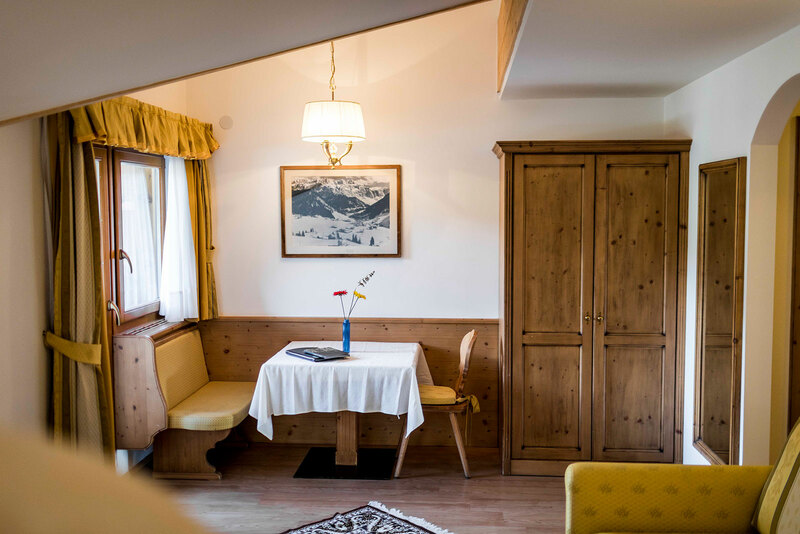 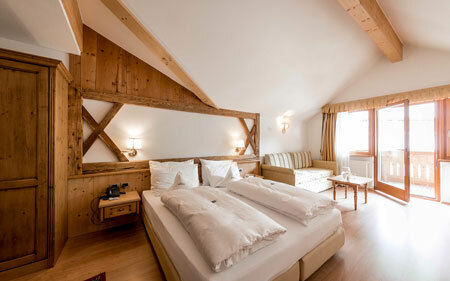 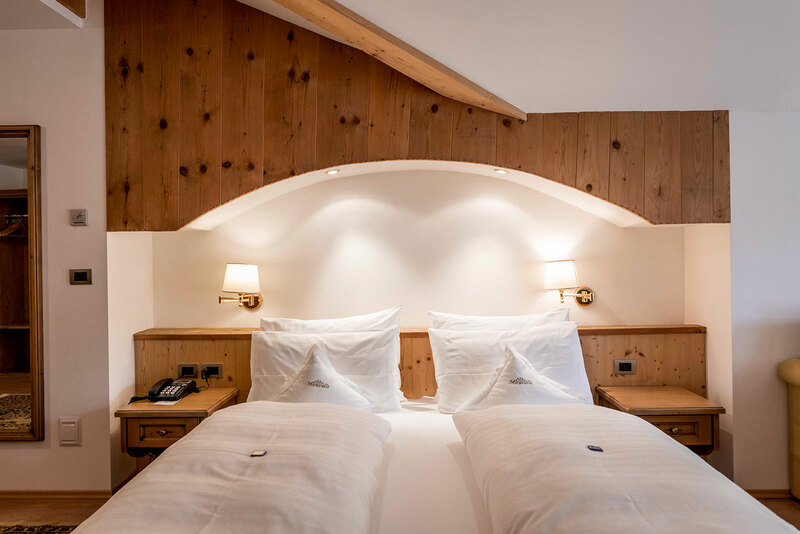 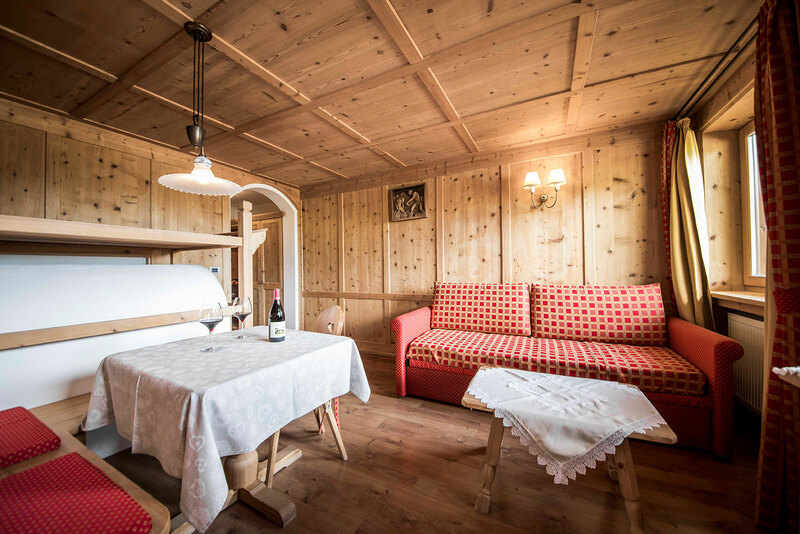 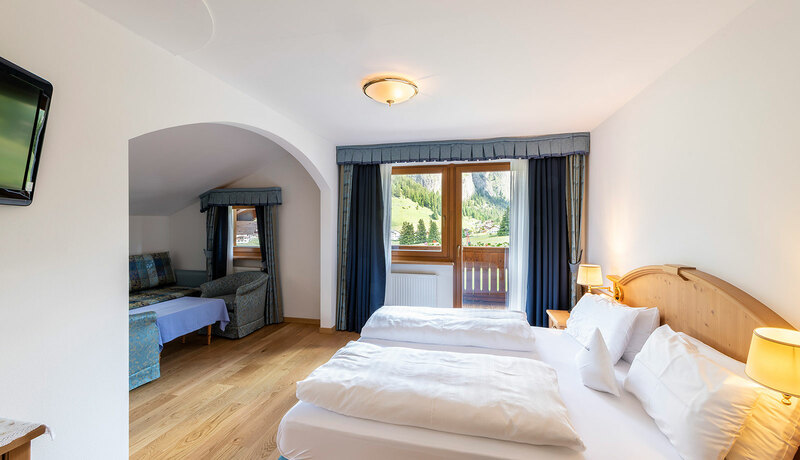 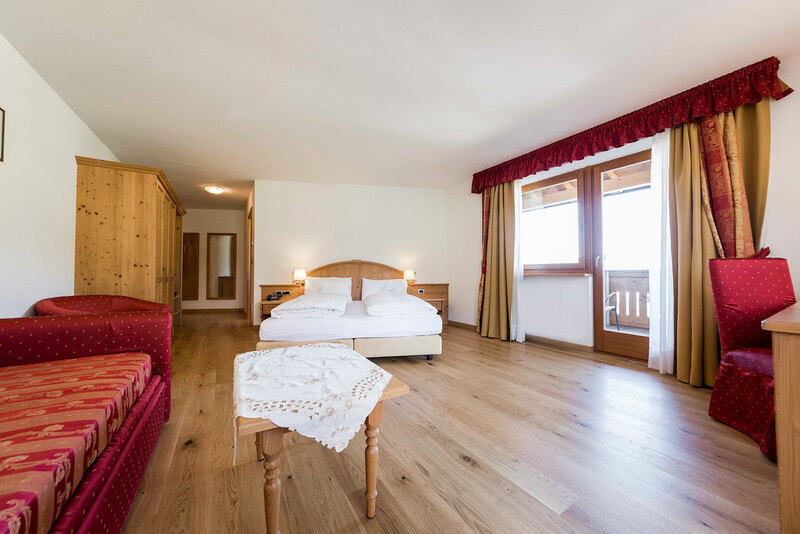 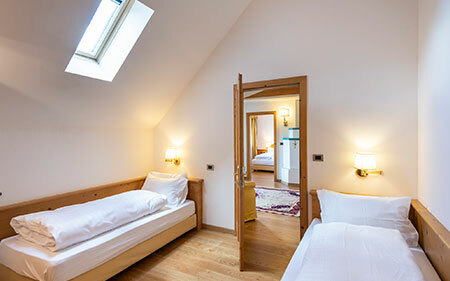 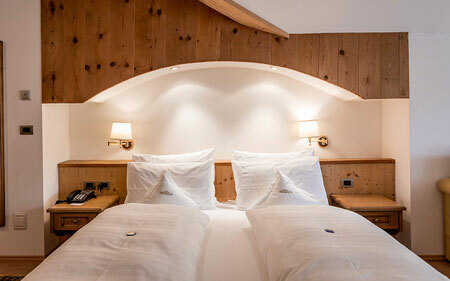 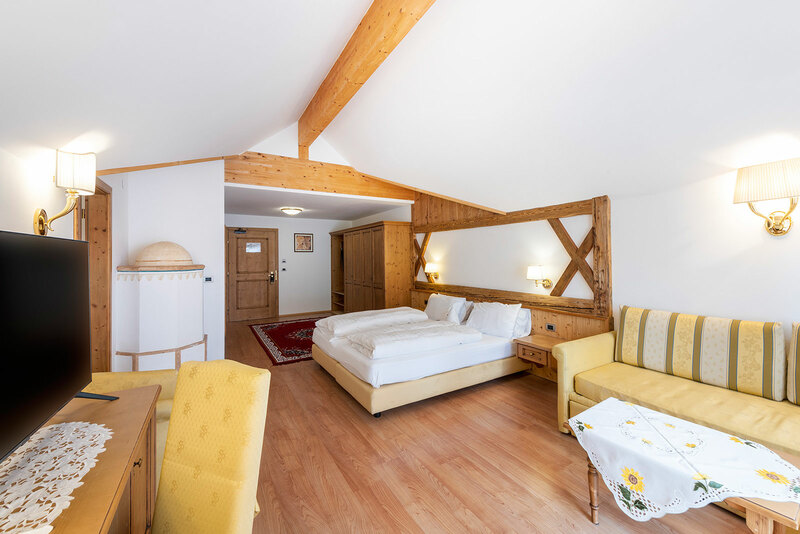 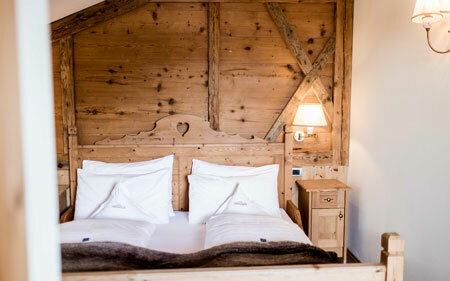 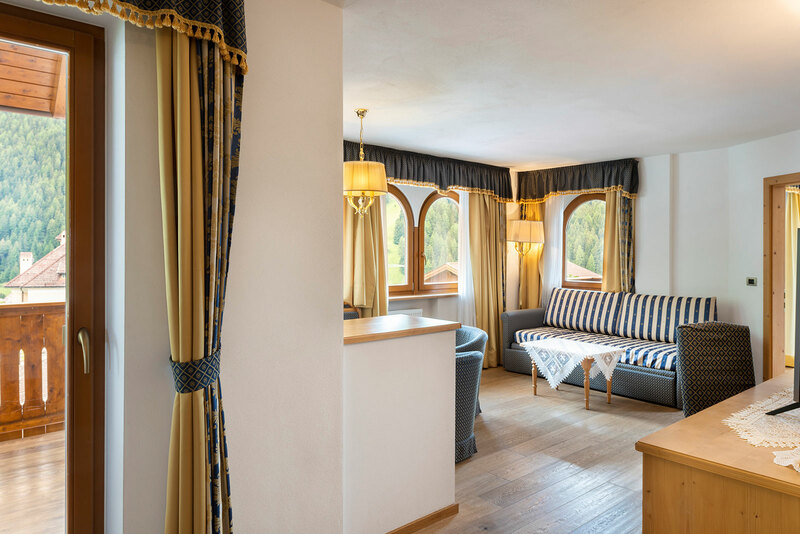 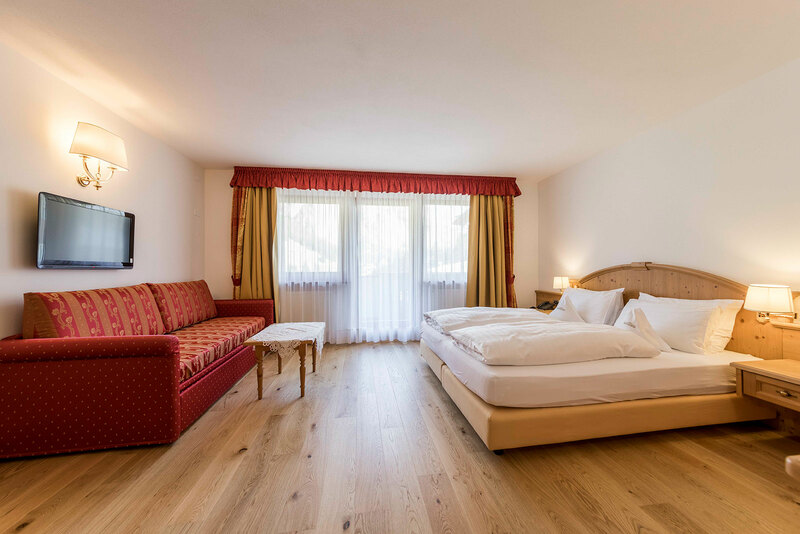 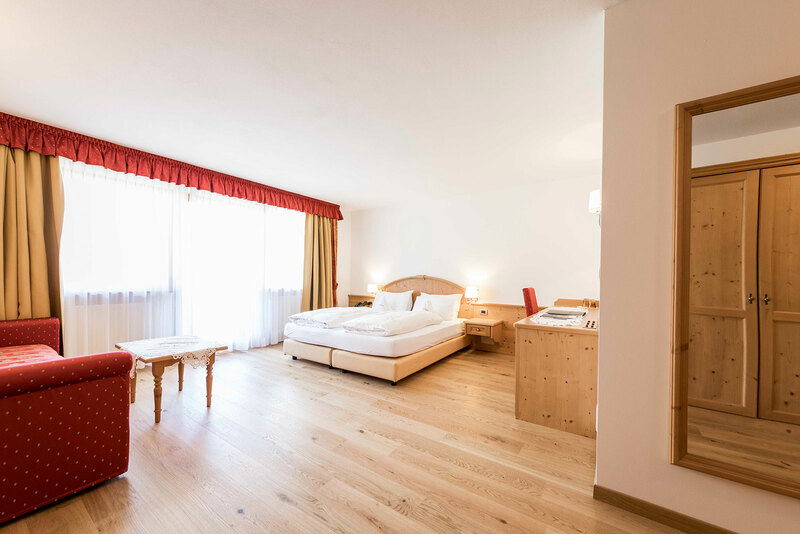 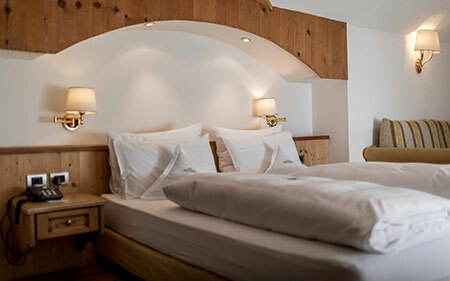 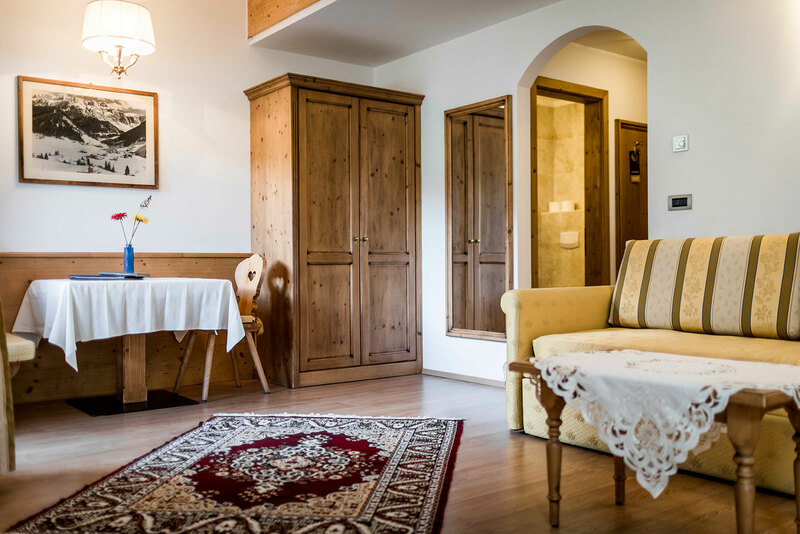 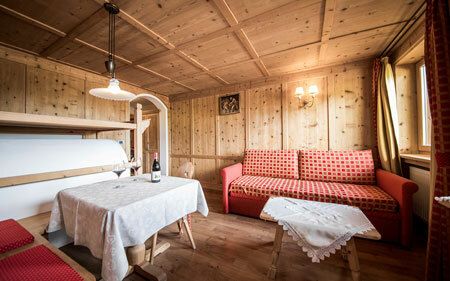 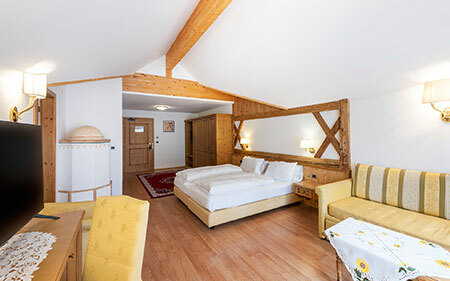 “Tyrolean” Suite (55 m²): styled with an original Tyrolean furnishing, wooden floor, double bed, living-room with a Tyrolean rustic stove, table with chairs, couch, minibar, tea machine „Tealounge“, TV, internet access, WLAN, safe, telephone, balcony, bathroom with "Jacuzzi" bath, WC and hairdryer. Suite “Romantic” (57 m²): with wooden floor, very spacious, consists of a double bed, a single bed, sofa bed, TV, minibar, tea machine „Tealounge“, internet access, WLAN, balcony, telephone, safe, separate bathroom with "Jacuzzi" bath, special shower and hairdryer. 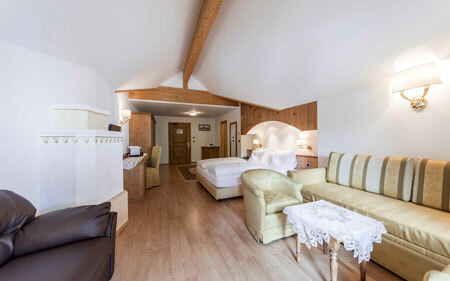 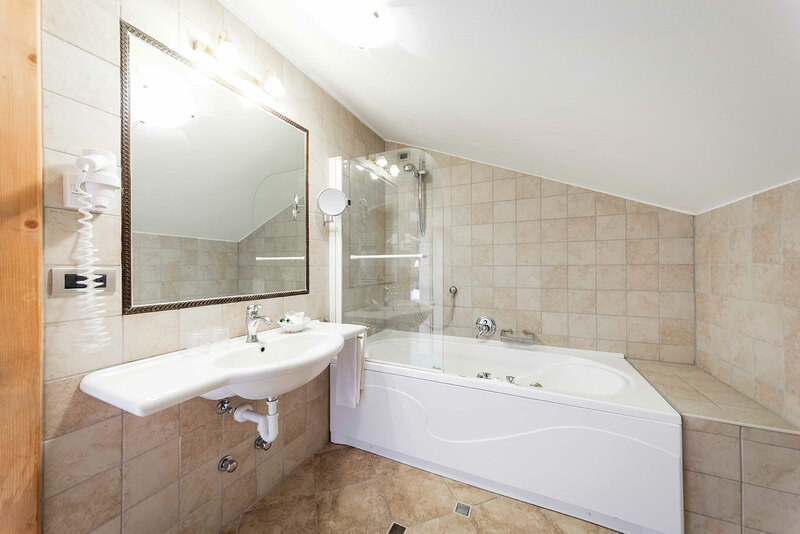 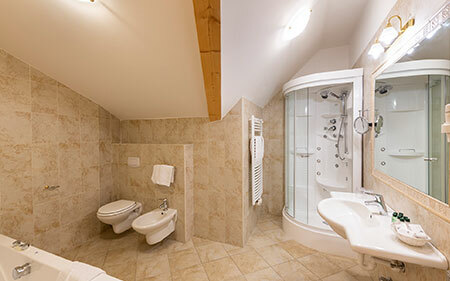 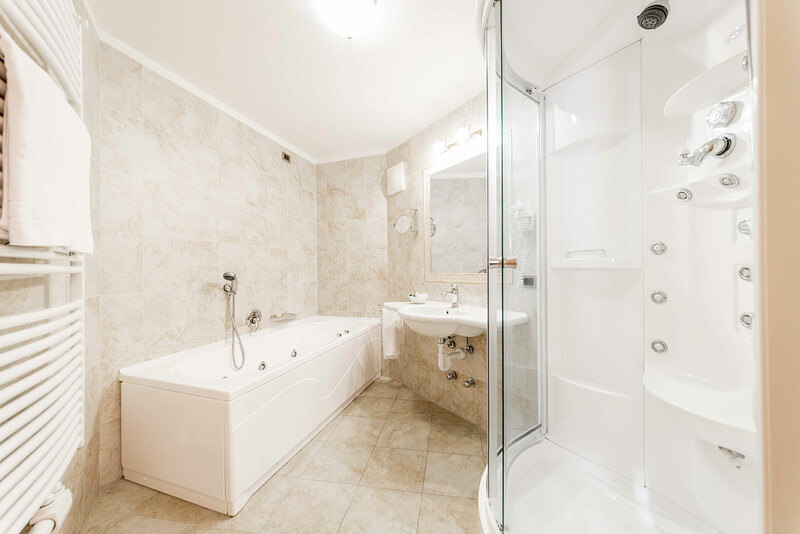 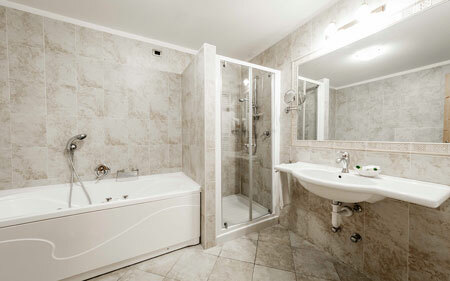 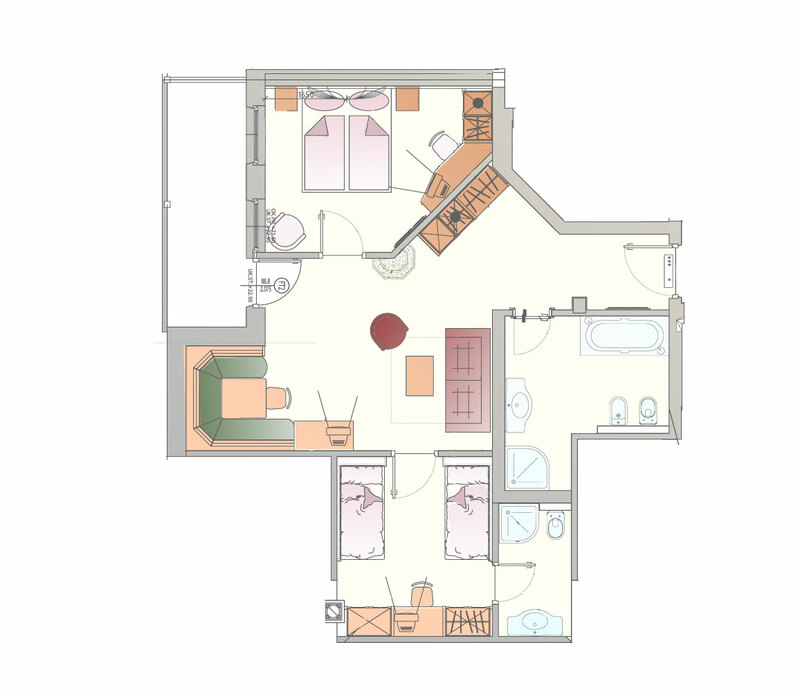 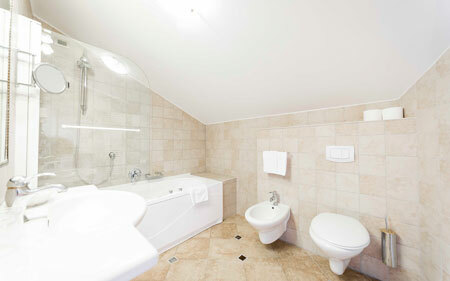 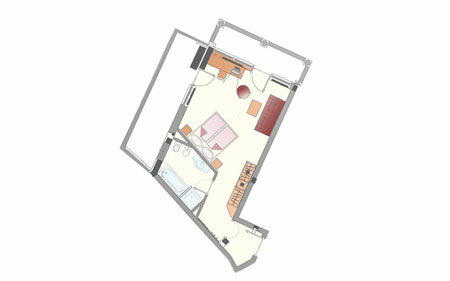 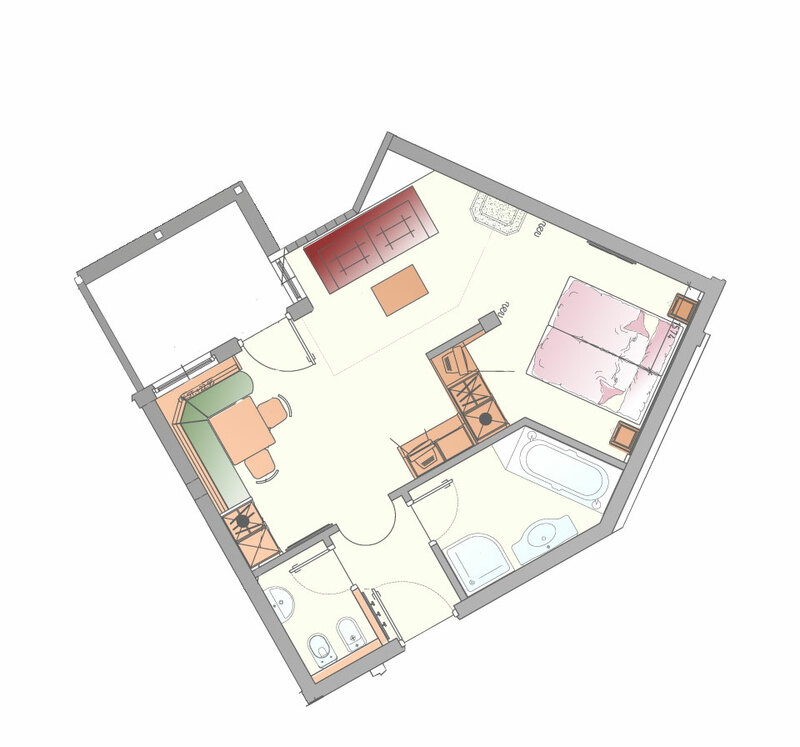 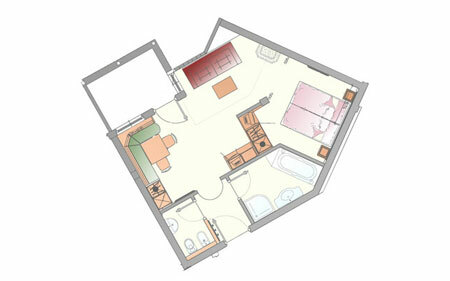 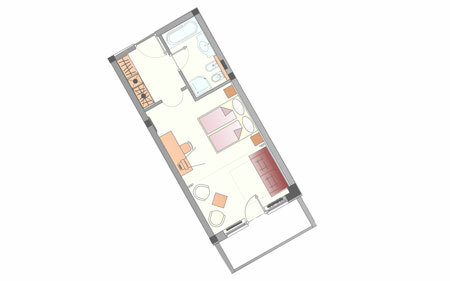 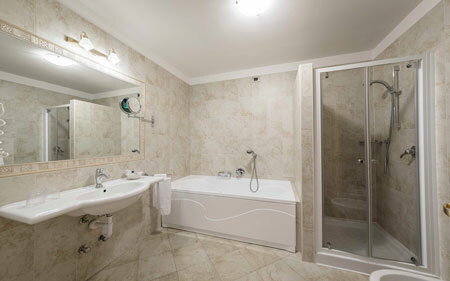 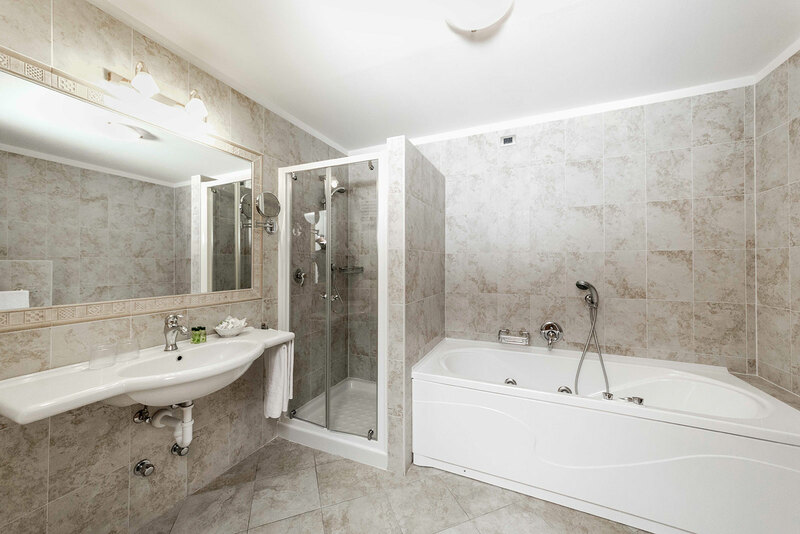 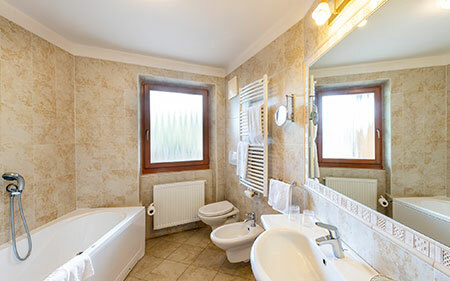 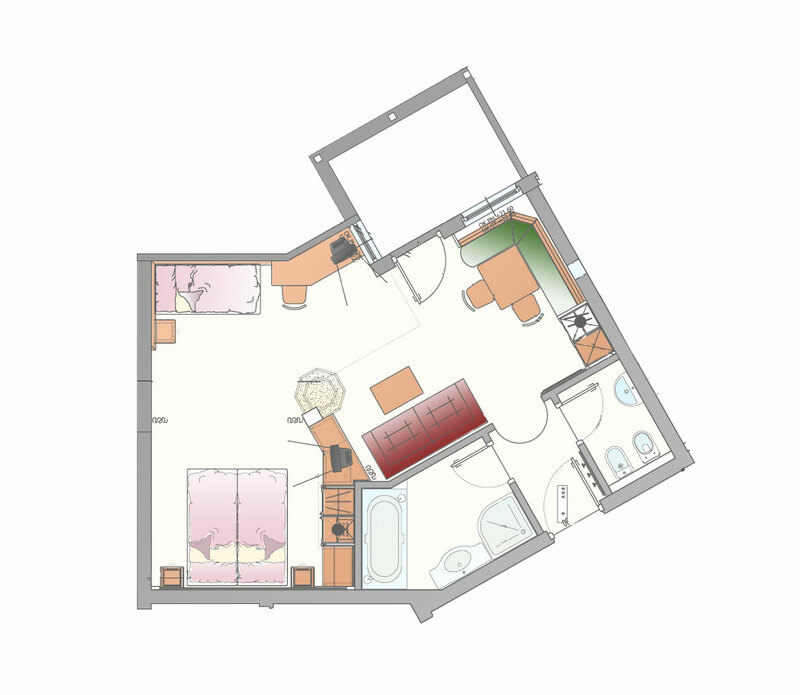 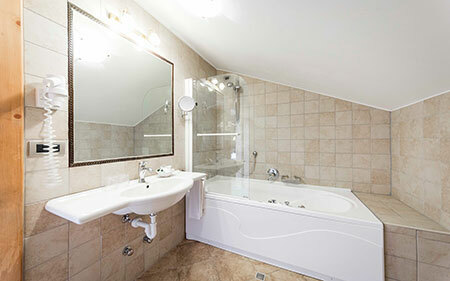 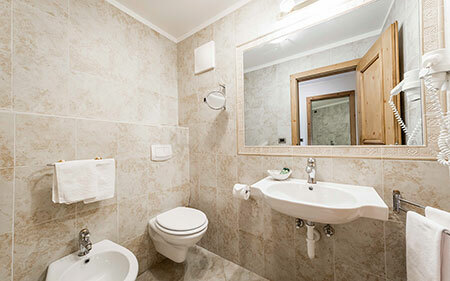 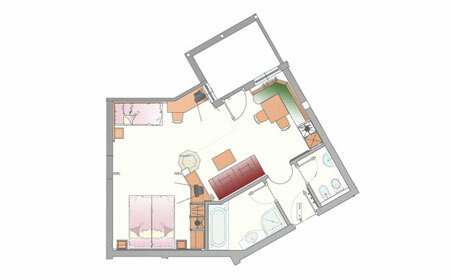 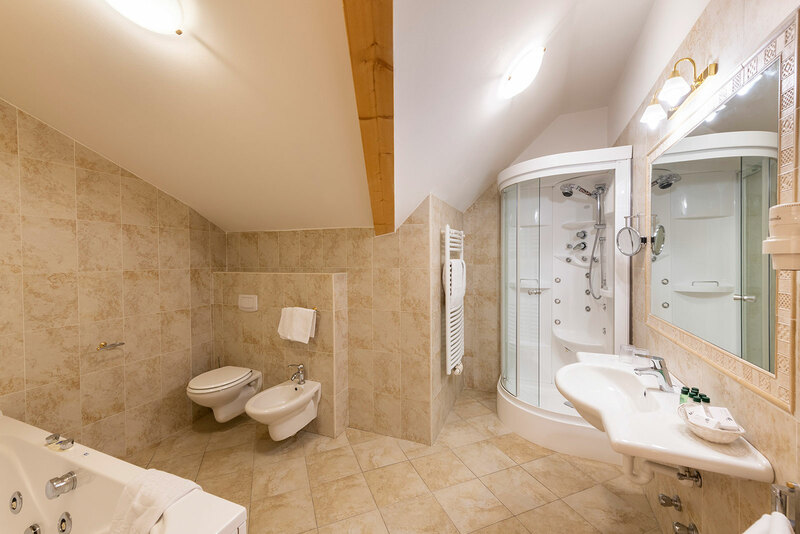 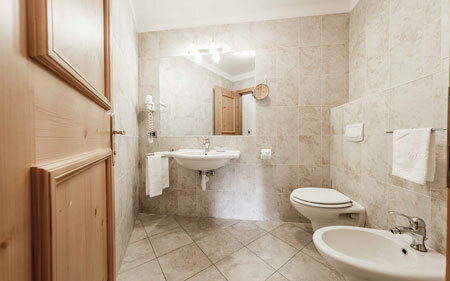 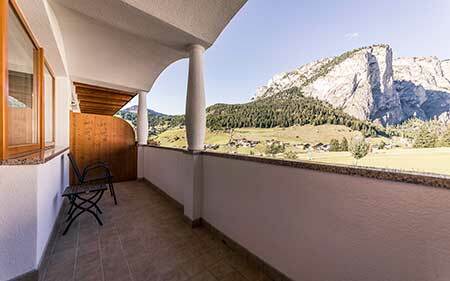 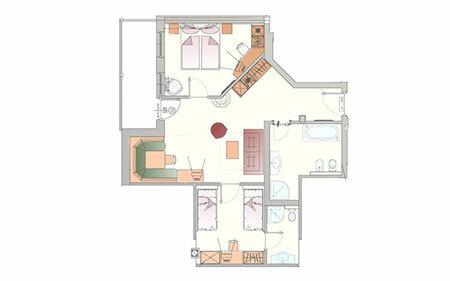 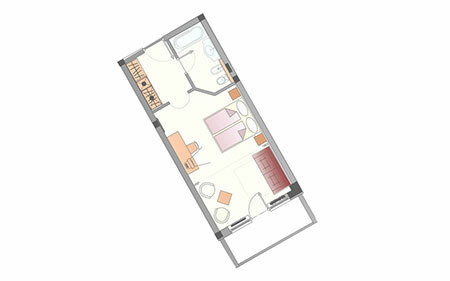 Suite “Stevia” (57 m²): with wooden floor, consists of a double bed, sofa bed, internet access, WLAN, safe, TV, minibar, tea machine „Tealounge“, balcony, telephone, separate bathroom with "Jacuzzi" bath, special shower and hairdryer. 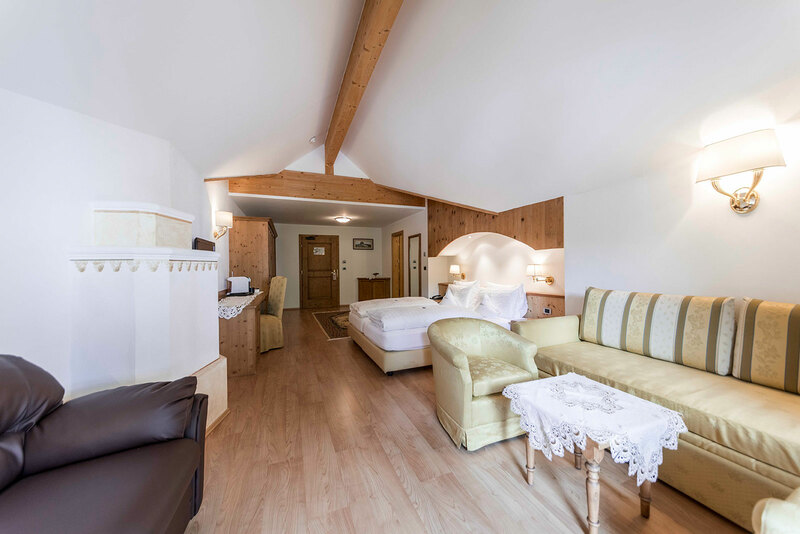 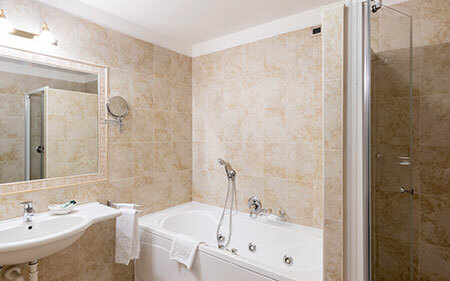 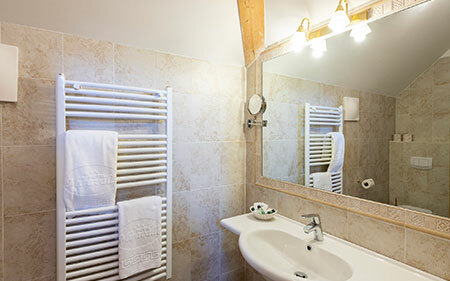 Suite “Le Rose” (60 m²): spacious double room with a wooden floor, a small room with two single beds, TV, internet access, WLAN, safe, telephone, minibar, tea machine „Tealounge“, balcony, bathroom with "Jacuzzi" bath, shower, WC and hairdryer. 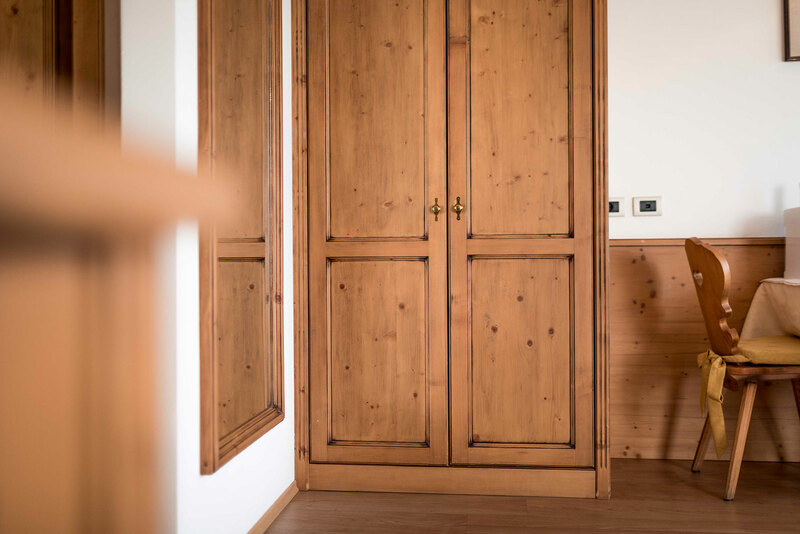 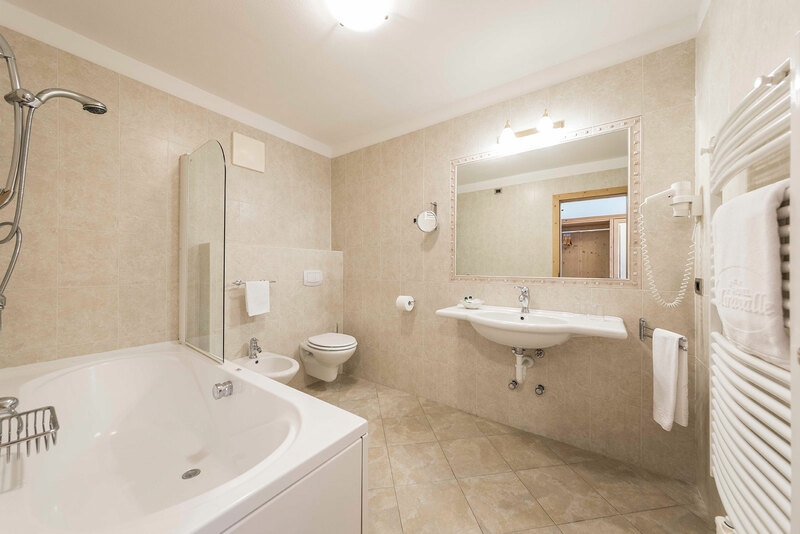 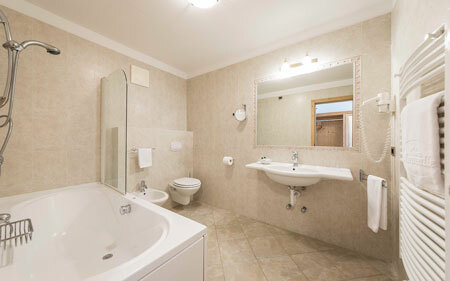 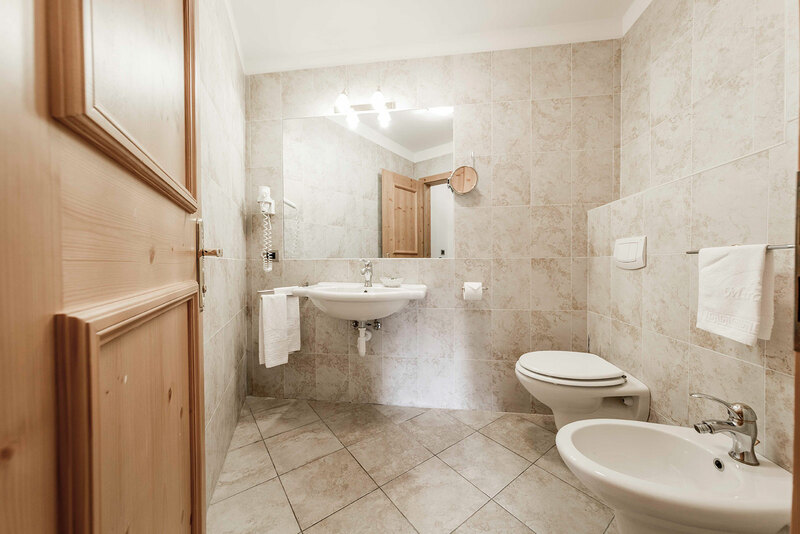 Suite “Sassolungo” (57 m²): very spacious, with wooden floor, consists of a double bed, sofa bed, TV, balcony, minibar, tea machine „Tealounge“, internet access, WLAN, safe, telephone, bathroom with "Jacuzzi" bath, shower, WC and hairdryer.